It is always a delightful treat when I get to go to a new restaurant to write about. Especially, one that is on the top 100 restaurants in the world, as well as going on a school night. So, it was music to my ears when my parents told me we would be eating at Cosme the following Monday. Cosme was rated the 25th best restaurant in the world!! 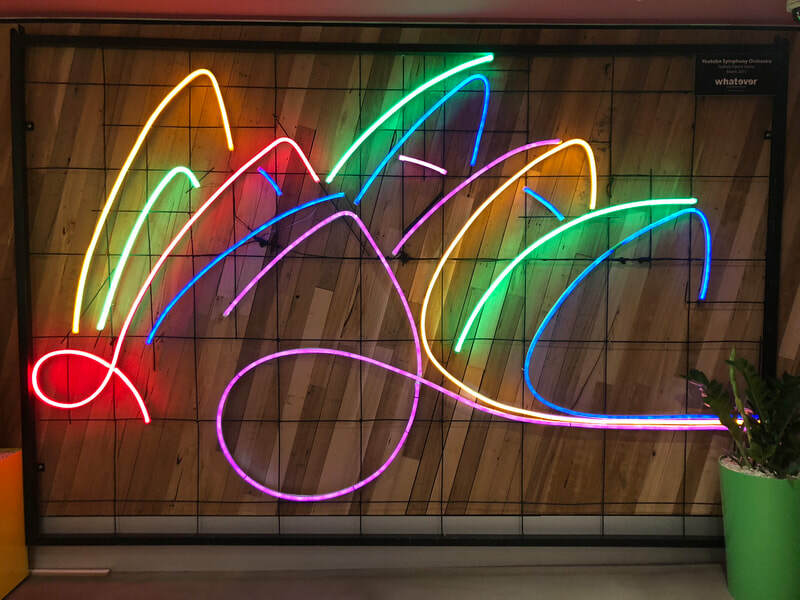 Cosme is a Modern Mexican restaurant, so the decor in the restaurant was very modern with a slight Mexican influence. The restaurant gave one the feel of being in a dessert. It had cacti as well as other succulents, and the color scheme was a lot of tans and beiges which closely resembled a dessert. As I had mentioned the decor was modern: their were low hanging lights, and comfortable chairs that varied at every table. The entire restaurant had a very rustic, dessert, aesthetic vibe that I absolutely loved. When we got to Cosme we met up with one of my dad’s colleagues, Holly, so my mom, my dad, Holly, and I were all there. As soon as we sat down we ordered drinks. I wasn’t sure if I wanted a specialty drink, but our waiter had recommended the Avocado Mocktail. At first, I was wary because an avocado drink sounded weird, but I was curious to see what it tasted like so I ordered the mocktail. The Avocado Mocktail was excellent!! The avocado didn’t contribute the flavor it mostly put forth the texture of the drink, and the lemon really gave it a sour flavor that wasn’t to overwhelming. The drink was smooth and the avocado did a nice job of mellowing out the lemon so it left a refreshing mellow drink. To start off our meal, we felt that it was a necessity to order the guacamole. I mean whenever guacamole is on the menu I almost always order it because it is the perfect way to start off the meal. On our table we already had salsa and the guacamole came with round tostadas for us to dip in the guac and salsa. First, I want to acknowledge the boldness of Cosme for giving us tostadas instead of chips. Normally, I find tostadas too big and not as desirable when eating guacamole and salsa. Cosme’s tostadas however, were so crispy and although we kind of had to break it up in pieces the tostada still did not disappoint. Next, the salsa. It was a very interesting salsa because normally when I think about salsa I think of a chunky tomato salsa that is usually moderately spicy (depending on preference and spice tolerance). This salsa was unique, it was a very smooth salsa that had sesame seeds in it. So, instead of just an overpowering tomato taste it had a subtle spicy taste with a nutty undertone from the sesame seeds. Personally, it was nice to not have such a basic salsa and it really brought out the sophisticated side of the restaurant. The guacamole was not as creative as the salsa, but what it lacked in creativity it had in flavor. It was mostly smooth, but had just enough chunks. There was a hint of lime and there weren’t too many ingredients that your tostada broke. Which just showed the modernness of not just the furniture, but the food as well. The guacamole and salsa were the perfect way to start out our meal. The appetizers we got at Cosme were the abalone tostada, the crab infladita, and the cobia al pastor. To start off our appetizers, we ordered the abalone tostada. So for those of you who don’t know abalone is a sea snail, but it is still considered fish. The dish was a tostada, with the salsa, and abalone sashimi on top. The abalone tasted like a white fish sashimi and didn’t taste too crazy. Even though “sea snail” might freak some people out it was just like any other sashimi you would have. The whole dish was refreshing and the perfect appetizer you would want before a big meal because it isn’t super filling. Our second appetizer was a Crab Infladita. It was a crunchy ball that you had to crack open with a spoon. The ball was filled with crab and guacamole. The crab was sooooo tasty. It was packed with flavor, the crab also was a little bit sweet, and super tender. Moreover, the outside was nice and crunchy. So, the creaminess of the guacamole, the crispiness of the ball, and the tenderness of the crab all had very compatible textures and flavors. The dish was very delicious, but it was a little bit hard to split between four people. So, I would recommend getting it if you were by yourself, but not if you were in a big group of people. Our last appetizer might have been my favorite thing from the whole dinner. It was a Cobia al Pastor with pineapple puree and cilantro. The dish was basically a make your own tostada. It came with cobia, tostadas, and the pineapple puree. You put the pineapple puree on the tostada with a few pieces of cobia on top. As soon as I took a bite, I was transported to Hawaii. The pineapple puree tasted exactly like a piña colada, the cobia had that amazing fresh taste to it, and of course the tostada elevated it. The tostada had an amazing crunch to round of all of the textures of the dish and had a saltiness that contrasted the pineapple making the dish taste amazing. Out of all the appetizers my favorite was the Cobia al Pastor. It was a great sharing dish and had amazing flavors across the board. Now it is time for the main dishes!!! For our entrees, we all split the sweet corn tlayuda, the lamb belly, and the duck carnitas. The sweet corn tlayuda came with sweet corn, chanterelle mushrooms, king trumpet mushrooms, and melted NY cheddar cheese on top. The corn made the dish very sweet and I thought it could have been a little bit more flavorful, but I thought it was a pretty good dish and the cheese on top went surprisingly well with the corn and the mushrooms. I would definitely recommend this dish if you were a vegetarian, or if you like the combination of corn and mushrooms. I personally didn’t love it because I like them separately, but that is my personal opinion because everyone else at the table loved the dish. Our next dish was amazing!! It was one of my favorite dishes besides the cobia al pastor. The dish was lamb belly. I had not had lamb since Australia and they are known for lamb so I was a little skeptical, but it was so tender and just melted in my mouth. The lamb was packed with flavour and if I could I would have ordered three orders, but I had to save room for the rest of the meal. The lamb was tangy, and the green mango that was with the lamb added a nice refreshing crunch. I highly recommend ordering the lamb belly. Our last entree were the duck carnitas. 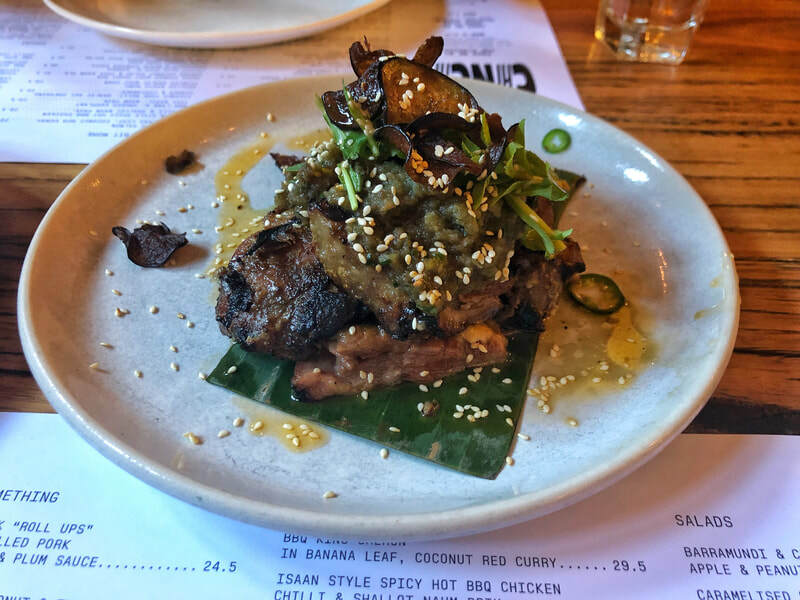 The duck carnitas are perfect for a big group and they were a nice way to top off our meal. They came on a humongous plate with watermelon radishes, tortillas for the duck, and different sauces to put on the duck. I took a few pieces of duck, with one watermelon radish, and the mild sauce. WARNING: IF YOU ARE NOT SPICE TOLERANT DO NOT EAT TOO MANY WATERMELON RADISHES!! I ate a watermelon radish without the duck and couldn’t stop drinking water for the rest of the night. Back to the carnitas. The duck was tender, the watermelon radish added a nice crunch, and the sauce completely enhanced the dish. Pro Tip: put the salsa they initially put on the table on top of the tacos to elevate the dish. All of the entrees were super delicious in their own way, but my favorite entree was the lamb belly. To wrap up this dinner, it was only right to order dessert. So, for dessert we ordered the corn husk meringue, and the pistachio ice cream with caramelized cacao butter. The husk meringue was their most famous dessert and was a meringue made out of corn husk with corn cream inside of the meringue. The husk meringue was unlike any other dessert I have ever tried. The outside was crispy and a little chewy, while the inside was sweet, but had a natural taste to it. The dish was a little salty as well, which balanced out the sweetness because sometimes desserts are overly sweet. Next was the pistachio ice cream. The pistachio ice cream was sweet, but was salty. The caramelized cacao butter balanced it out. I could not stop eating the cacao butter it was my favorite part of the dish. On top of the ice cream and the butter, there were also freeze dried raspberries which gave a nice tangy flavor to the dessert. Although, I was obsessed with the cacao butter the entire dish had nice flavour combinations and was overall very tasty. Out of both desserts the most delectable was definitely the husk meringue, it was also the most unique which I loved. 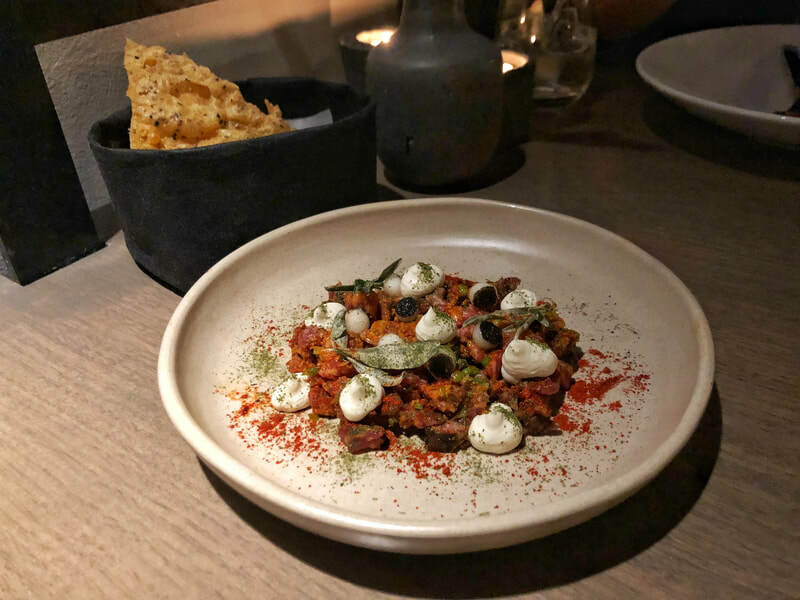 This dinner was amazing and I highly recommend going to Cosme and maybe trying a dish we didn’t order. 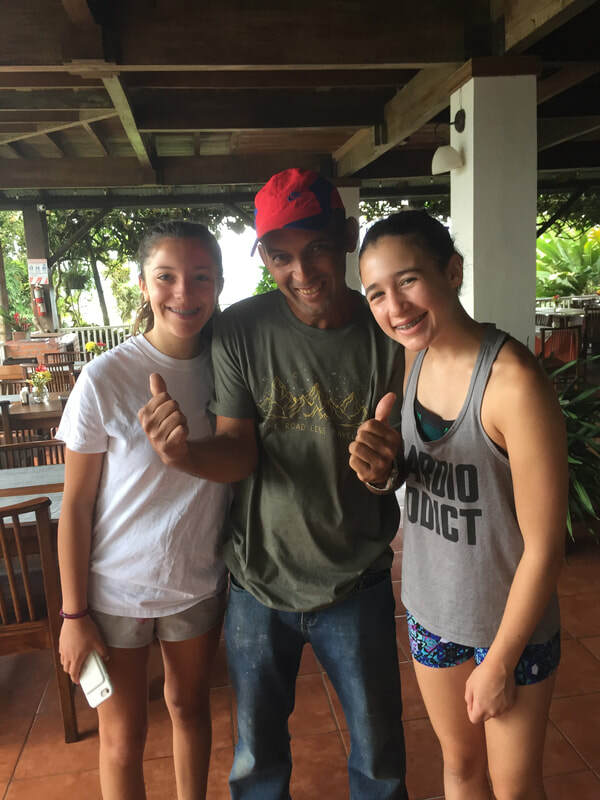 This summer I had another amazing opportunity to go to Costa Rica on a service trip. 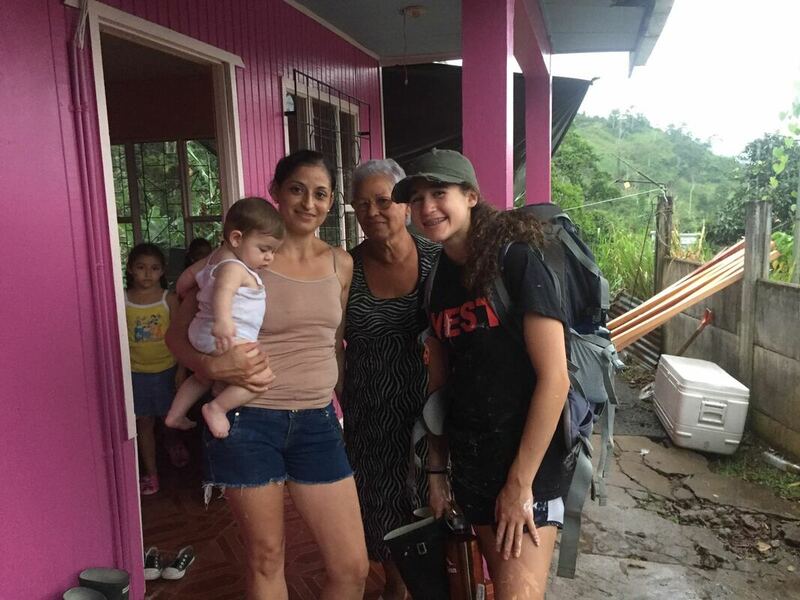 While I was there I spent three days rebuilding a house in Turrialba for a mother and her four children and I also went whitewater rafting for two days afterwards. While I was there I learned a lot and I also ate a lot. In Costa Rica they have a lot of differences in their meals one of them is at breakfast. America usually eats cereal, pancakes, bacon, and eggs for breakfast and Costa Rica has those foods for breakfast too, but one of their most common foods for breakfast is rice and beans. Rice and beans for breakfast might not seem super appealing, but it is really delicious they have lots of seasonings and you usually have it with eggs and toast. For some reason in Costa Rica the eggs are a lot fluffier and fresher than the ones in America. After we had fixed up the house for the family we went white water rafting. They taught us all of the signals and motions. We got on the rafts and rafted for an hour until we reached our campsite where we would be spending the night. After we had gotten showered and dried off there was a cooking lesson by the kitchen area. We would be taught how to cut fruits and make empanadas. First was the fruit, we would be cutting watermelon and pineapple. The person showing us how to do this would Be Fez, Fez was one of our guides for the whitewater rafting and he worked alongside us for the three days fixing up the house. Fez showed us that we had to cut the watermelon into fourths. Then, we had to cut into the red part of the watermelon at the tip on both sides. We then had to cut along the rind on both sides again then you cut the fruit into slices and you didn’t have to worry about the rind. We did the exact same thing with the pineapple it is so much more efficient to cut it that way and lowers the chance of cutting yourself. Next we made the empanadas. For those of you who don’t know an empanada is fried corn dough stuffed with meat, cheese, beans, or all three. To start off we got corn flour in a bowl and Fez added water to it, we mixed the two ingredients together in the bowl they formed a dough. Once we had a ball of dough we made the dough into little balls. We then flattened them out so they were about 1 inch thick, next we stuffed it with meat, cheese, and beans. Afterwards we folded the dough over and sealed it by pressing a fork along the edges. Lastly we gave it to Fez so he could fry them. After a big day of whitewater rafting it felt so nice to sink my teeth into a crunchy empanada. They were so delicious and I am very grateful that Fez showed all of us these new recipes and techniques. 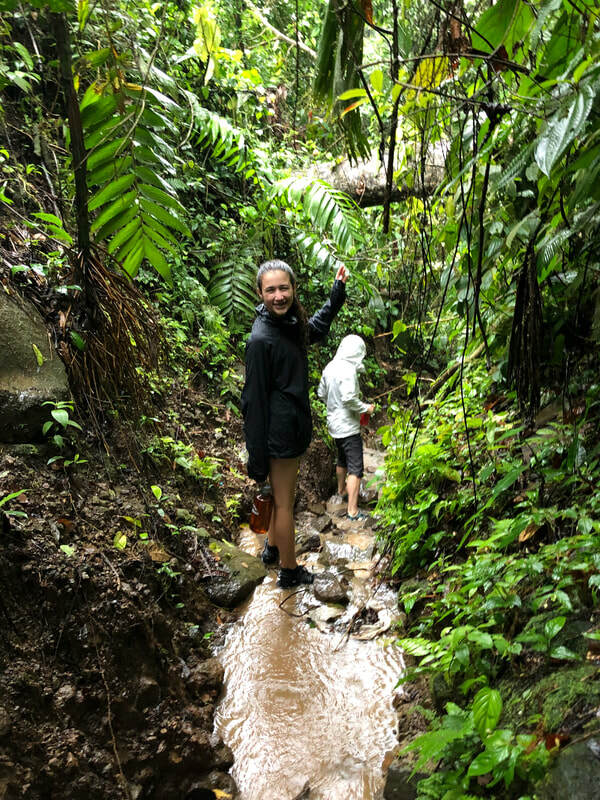 Costa Rica was an amazing experience and I definitely want to go back there. One of my last vacations this summer was to the Cape, my parents had a wedding and since none of us had been to The Cape we all went. We stayed with our friends the Whitehead’s and they lived really close to P-Town, so on our last night they took us to Victor’s. Victor’s is a restaurant that they had raved to us about and said that we had to go there. This restaurant was really fancy and they didn’t just have a menu where everyone would get their own individual meals they had lots of appetizers. So, we all ordered a lot of appetizers and we shared them. The first dish we had was brussel sprouts with hazelnuts. The brussel sprouts were really soft and the hazelnuts gave it that nice crunch, so the textures in the dish were very pleasant. The taste of the dish was amazing and had so much flavor and overall I really enjoyed the dish. The second dish was edamame, although edamame is very simple and is usually enjoyed with a little sea salt these ones had a burst of flavor. They tasted amazing because they were soaked in soy sauce because you didn’t just get the flavor from the pod you also got it from the bean itself. In addition to the soy sauce there was red chili and sea salt on top. The chili gave the beans that bang of spice and it is always nice to have some sea salt on edamame even with the soy sauce on it. The third dish was calamari. I love everything about calamari the chewiness of the octopus, the crunchiness of the fried outer part, everything!!! This calamari was no different it was crispy and chewy and was so good I kept putting more and more of it on my plate because I couldn’t get enough. The fourth dish were hand made pan fried pork dumplings covered in peanut sauce. 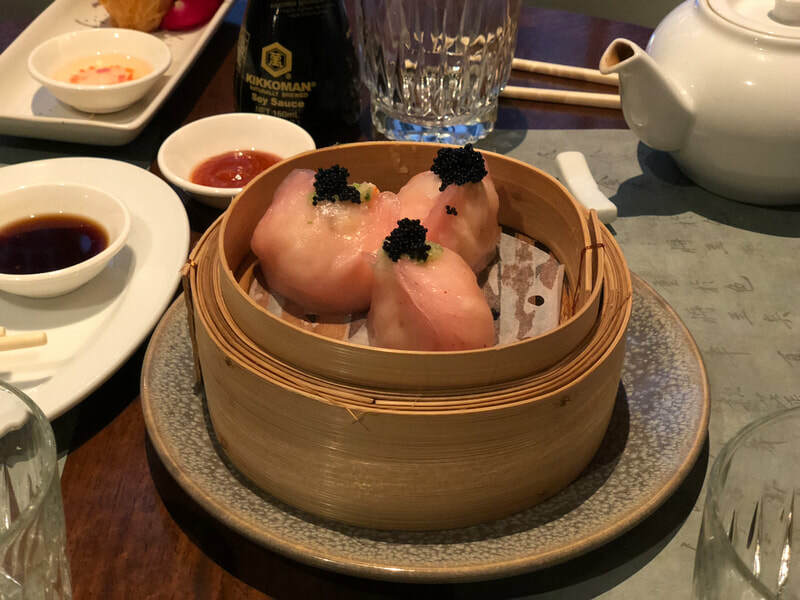 Dumplings are definitely very different in the way they are prepared, what kinds of ingredients are in them, and the different sauces people dip, or pour on the dumplings. Personally, I prefer my dumplings pan fried like they were in this dish because they are super crispy and not doughy. Some people like it doughy, but I just don’t. 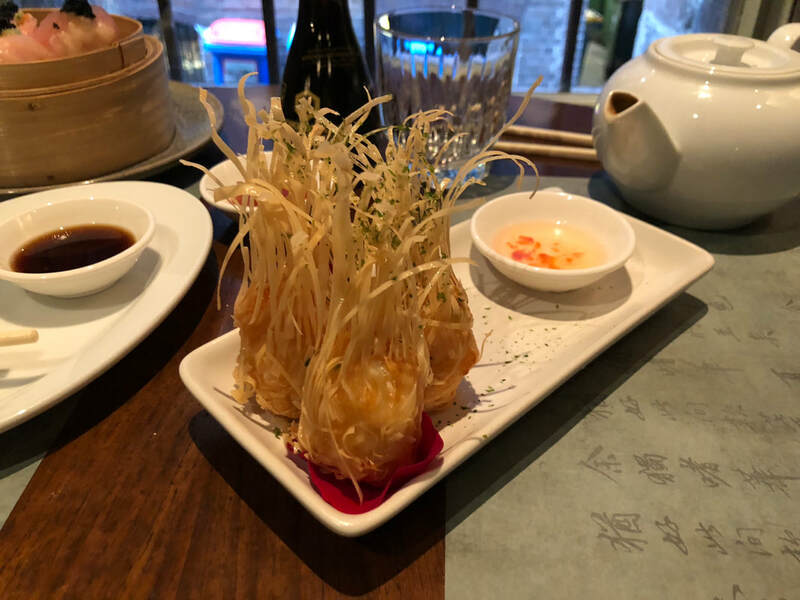 The dumplings here met my perfect dumpling standards they were super crispy and although I would normally dip my dumplings in soy sauce the peanut sauce added a good unexpected sweetness to the dish and tied the whole dish together. The sauce was especially a good addition because the pork in the dumpling was salty so you had the balance of sweet and salty. The fifth dish was sizzling Asian skirt steak. The steak was served to us in a little iron skillet that was EXTREMELY HOT but luckily we did not touch it so no one got burned. Steak can be very good if it is cooked right and has a lot of flavor because if steak is bland it is terrible. As you can see Victor’s has been very consistent with their amazing flavor and this time was no different. The steak had so much flavor and although it was on the hot pan it cooled off quickly and it was a nice medium throughout the meat. I don’t tend to eat steak very often, but when I do I want it to be good steak and this steak exceeded my expectations. The sixth dish was macaroni and cheese. I know what you are thinking macaroni and cheese? That is for younger kids it isn’t something you should post on a food blog. Although mac & cheese is traditionally a children’s food it can be elevated in so many different ways and is one of my favorite comfort foods. This macaroni and cheese had a nice panko crust covering the top and also had truffle oil in it. Usually when you make kid’s boxed macaroni and cheese it comes with the cheese powder and is really watery. This mac & cheese was the opposite it was creamy, made with real cheese, and had a panko crust on top. The panko crust always adds a lot of crunch to the macaroni and cheese and really balanced out the textures in the dish. 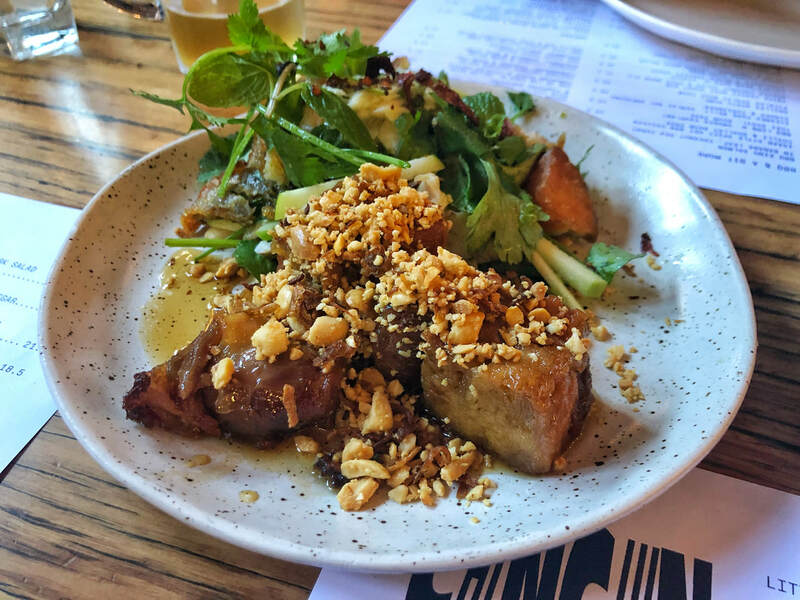 The truffle oil added a lot of depth to the dish and I love truffle oil, it always enhances any food and just makes dishes a lot more sophisticated. This last dish was definitely the most impressive of the night. It was mussels. I do not have mussels very often and I usually like oysters more, but these mussels were off the charts. They were sake steamed mussels!!!!! 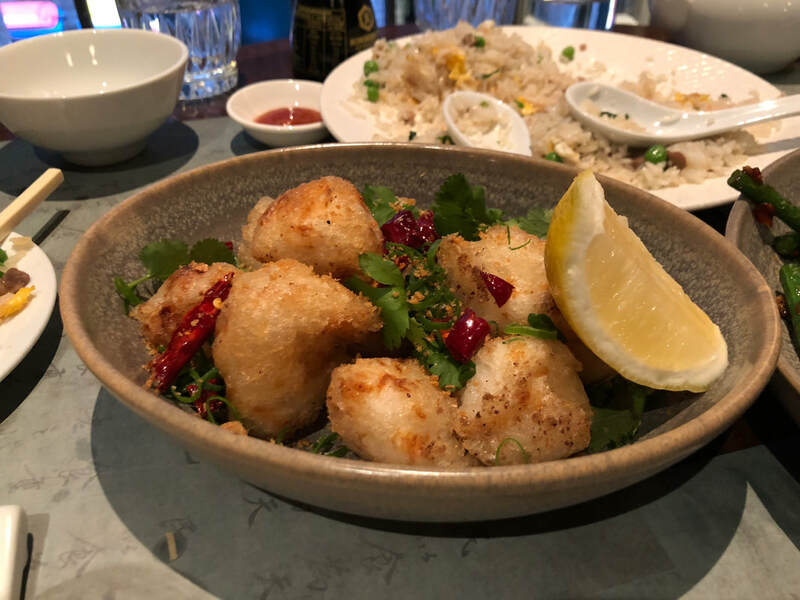 The sake brought out all of the flavour in this dish as soon as you took a bite. POW!! You got that amazing flavor of the sake. There isn’t a lot to say about this dish because it was just absolutely on point. I think that the sake was the star of the dish because it made the mussels 100 times better than just normal mussels. Overall Victor’s was amazing and I am so glad that our friends introduced us to this amazing restaurant!! 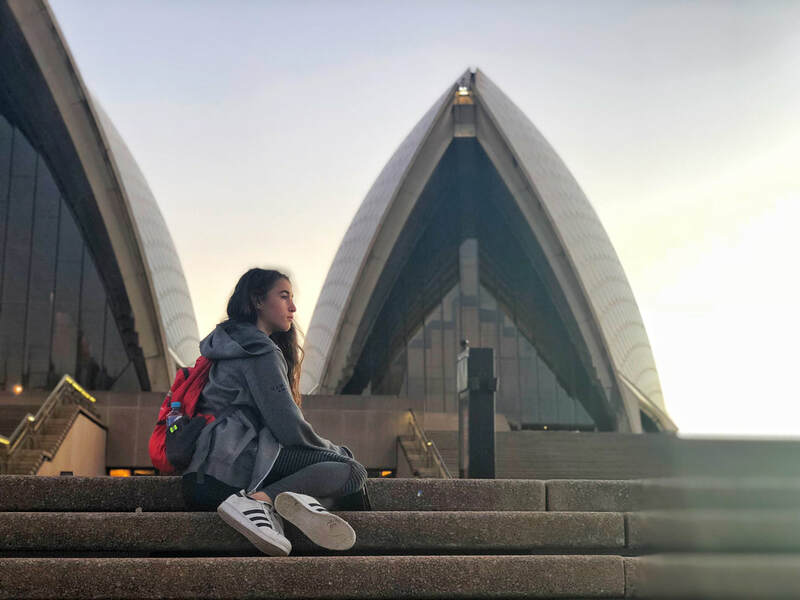 In my last post, I talked about the first part of our trip to Australia and the food in Melbourne. 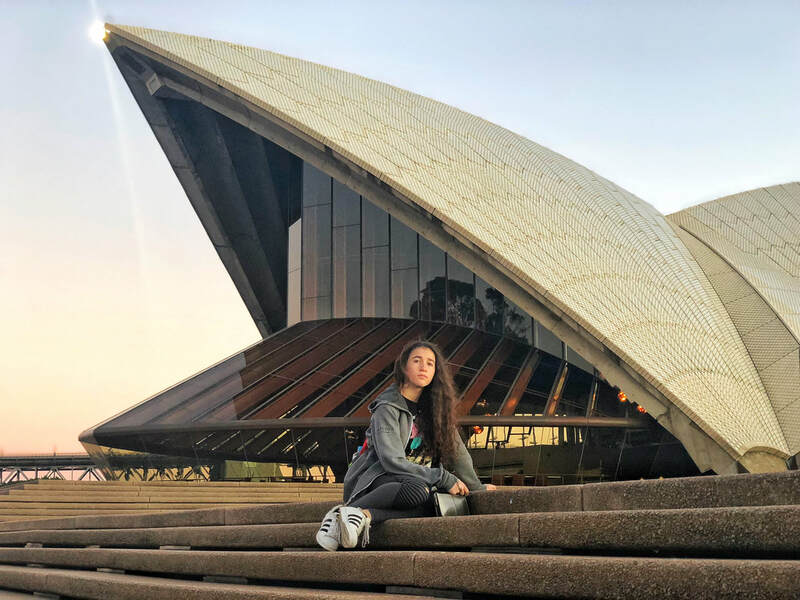 Our next adventure was in Sydney. 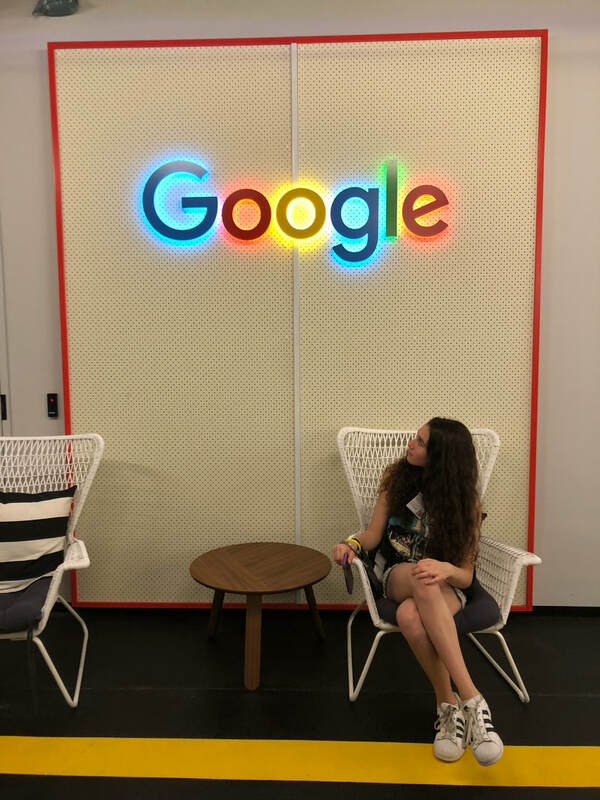 On our first day we actually had a tour of Google from our really amazing friend Kim. We had breakfast at the Google cafeteria and that, ladies and gentlemen, is where I had Vegemite for the first time. Vegemite is this really salty paste that is extremely popular in Australia. The trick with Vegemite is to not put a lot on you have to put a thin spread so the taste isn’t overwhelming. It wasn’t the best thing I have had, but it didn’t make me gag or anything. After our super awesome tour of the Google offices we went for a little bit of sightseeing and then went to lunch at Mr.Wongs. Mr. Wongs, like Tonka, was tucked into an alleyway, but inside was super fancy and we happened to get lucky again and we got the last table that wasn’t reserved. Mr. Wongs was a restaurant famously known for its dumplings. 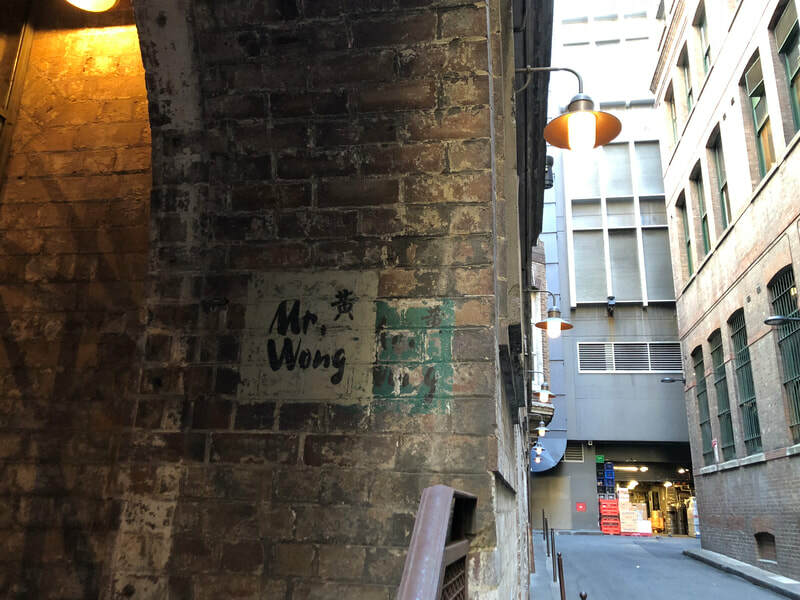 Mr. Wongs was a super cool place and it was the kind of restaurant people went for a business lunch. Obviously, we got dumplings and since Lindsay had never tried soup dumplings before we ordered soup dumplings, string beans and beef, fried rice, and shrimp croquettes. Soup dumplings are amazing because you get the hot soup on the inside and the soft doughy dumpling after, two foods in one. At Mr. Wongs the soup had a lemongrass flavor in it and the dough was super soft. 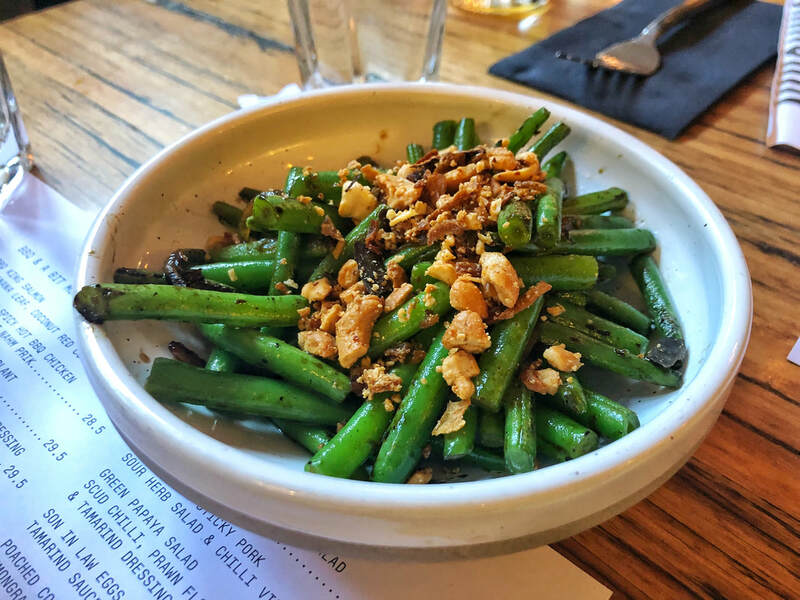 The next dish was the string beans and beef that was my favorite dish at Mr. Wongs. 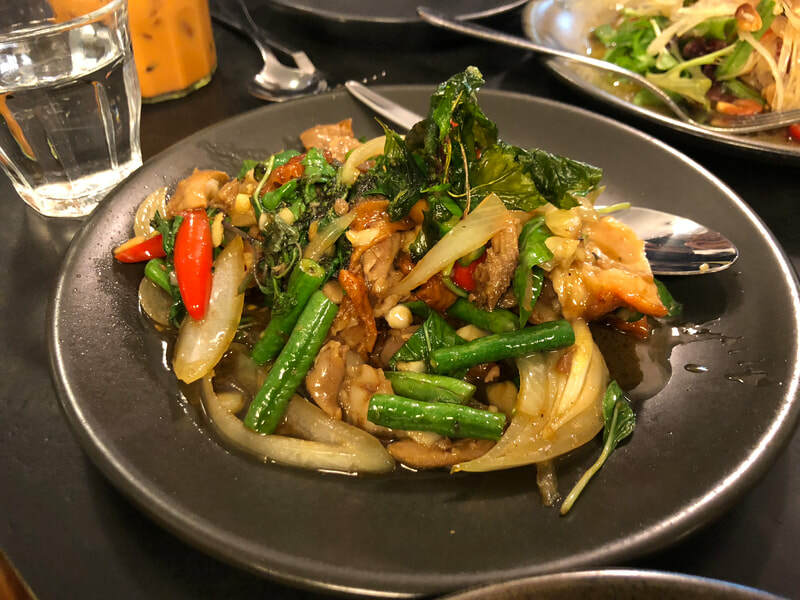 The string bean dishes were all amazing in Australia. 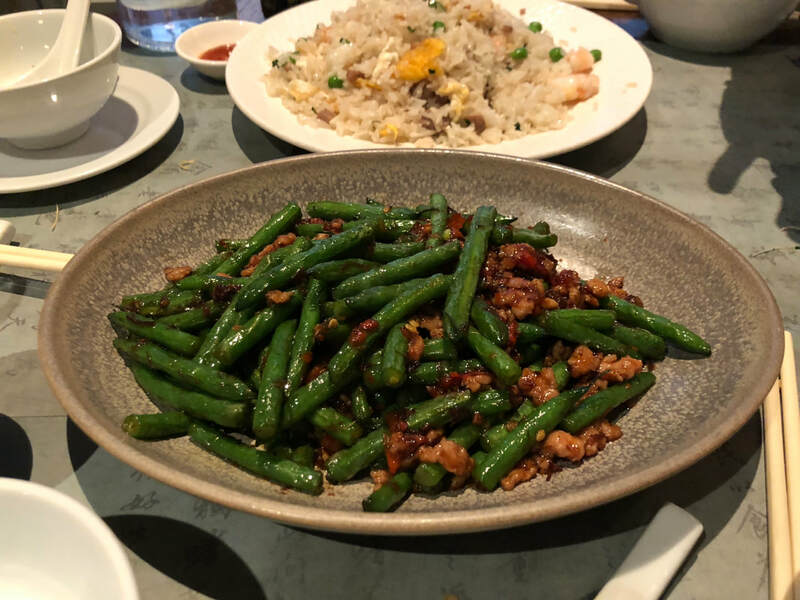 It was ground beef stir fried with string beans, it was packed with flavor and spices I kept putting more onto my plate because it was so delicious. Next, was the fried rice. 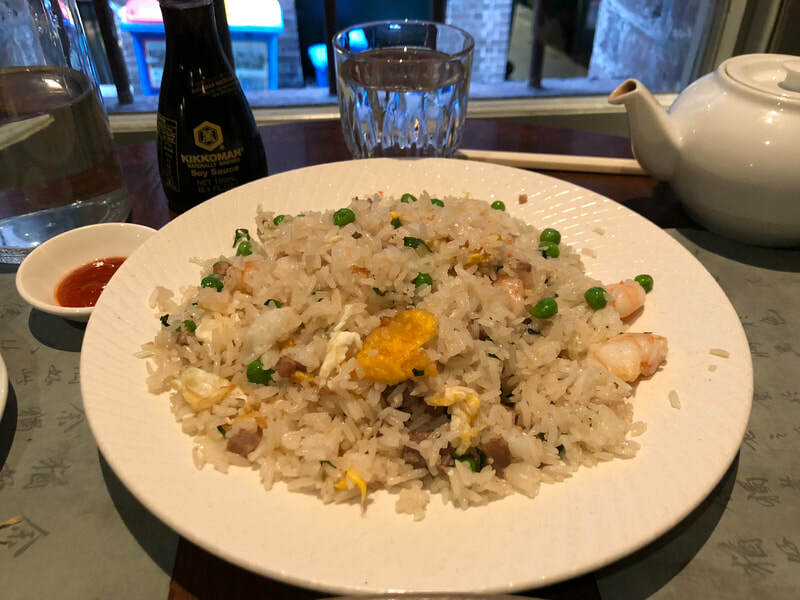 It was good fried rice, but it wasn’t super special. I mean it was just fried rice. The next dish was very special because it isn’t something that is very common like the other dishes. It was a crispy shrimp croquette. The croquettes were very tall and had these crispy strands sticking out of it with the shrimp on the bottom. They were super juicy and crunchy I got these crispy bits all over my plate. The last dish was again something you don’t usually find on a menu we had balmain bugs. Now you might be thinking that I already had bugs once, but balmain bugs are these tiny lobsters that they serve in Australia. We got the fried balmain bugs. They were very crunchy and really salty and the balmain bugs didn't taste like lobster at all. I didn't love them, but I think it was too salty for me. 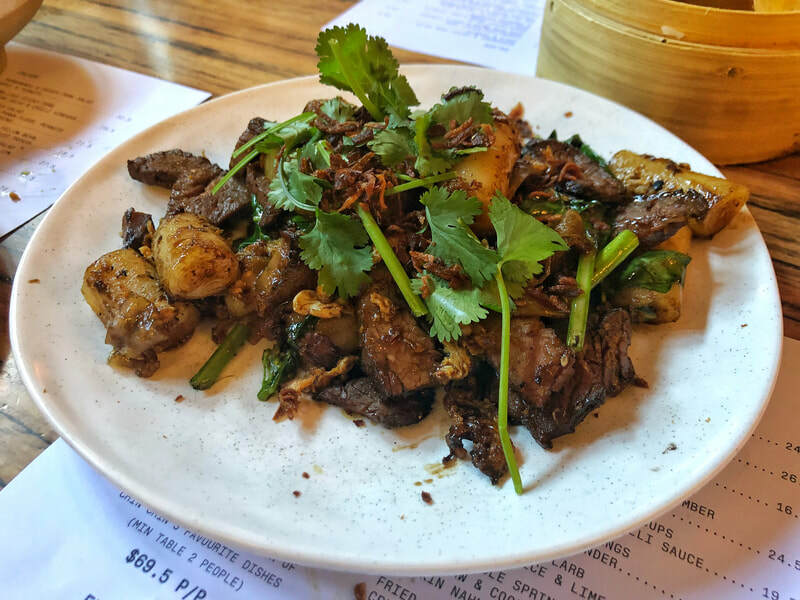 Overall Mr.Wongs was a nice place to have lunch and I would definitely recommend going there is if you go to Sydney. Australia is famous for a lot of things, but one of its most acclaimed desserts is the Lamington. 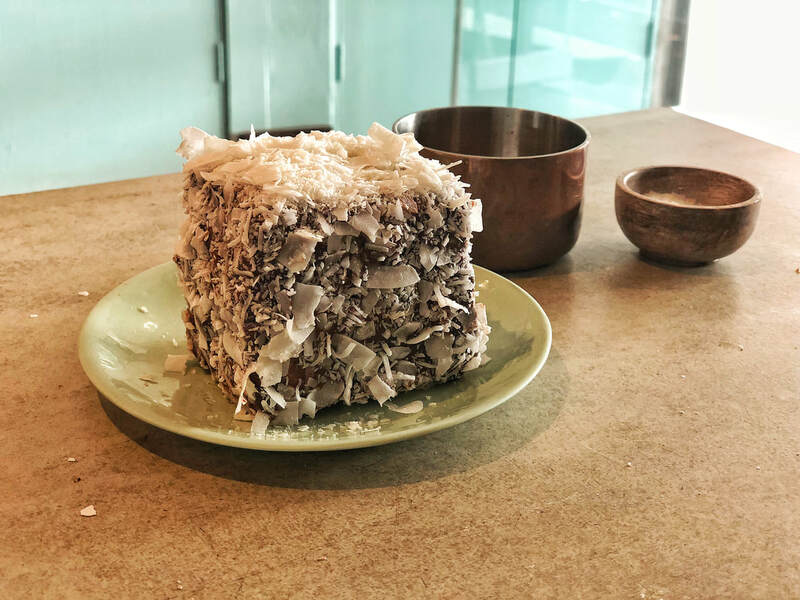 A Lamington is a pound cake that is layered with raspberry jam, covered with chocolate, then finally rolled in coconut flakes. The bakery that we had decided upon was a quaint bakery tucked into a street right near our hotel. We walked in and soon ordered a Lamington along with a sparkling lemonade to wash it down. The Lamington was amazing! We didn’t really know what to expect, but it was moist and the chocolate and jam balanced each other out leaving a delicious cake. The coconut contributed a nice crunch and a nutty flavour that was needed to tone these two powerful components. The lemonade was very refreshing and paired nicely with the cake. After we had left the bakery we found at that the tiny little bakery we just went to contained the best Lamington in Sydney. This next restaurant we went to was a restaurant on the rocks which means it was behind the Sydney Harbour Bridge. We went to the Australian Hotel and it is famously known for its Coat of Arms Pizza. The Australian Coat of Arms is a picture of an emu and a kangaroo so I am assuming you can guess what is on the pizza. Yup, kangaroo and emu. I was really nervous to try it because who isn't a little nervous to try kangaroo and emu? The Australian Hotel was a bar and a restaurant so we sat more in the restaurant part because we obviously couldn't sit at the bar. We ordered the pizzas and when they came I got really scared because I felt a little guilt eating a kangaroo and also an emu. It just looked like meat on the pizza. 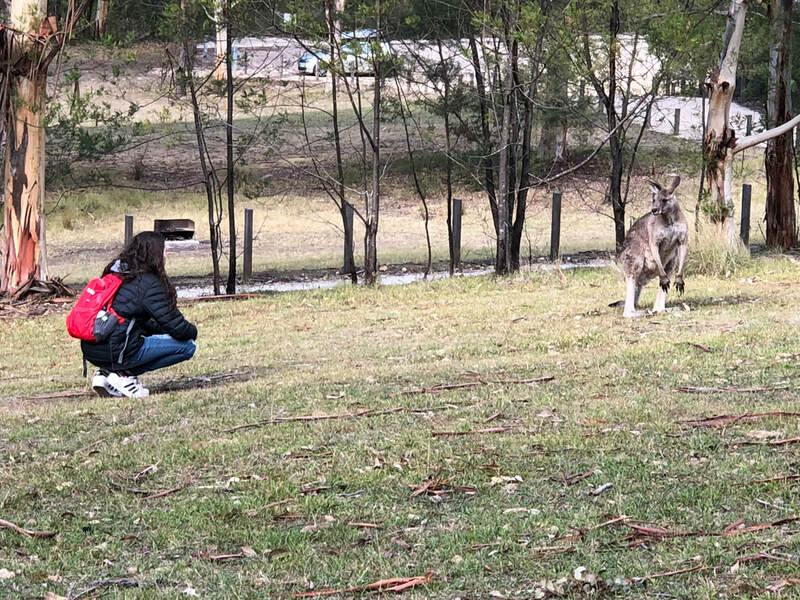 So I took two slices one with the emu and the other with the kangaroo. I brought the emu slice to my mouth and I took the tiniest bite of it. Although I took a tiny bite I could still taste it and guess what, it tasted like chicken. Ha ha just kidding it tasted more like beef. 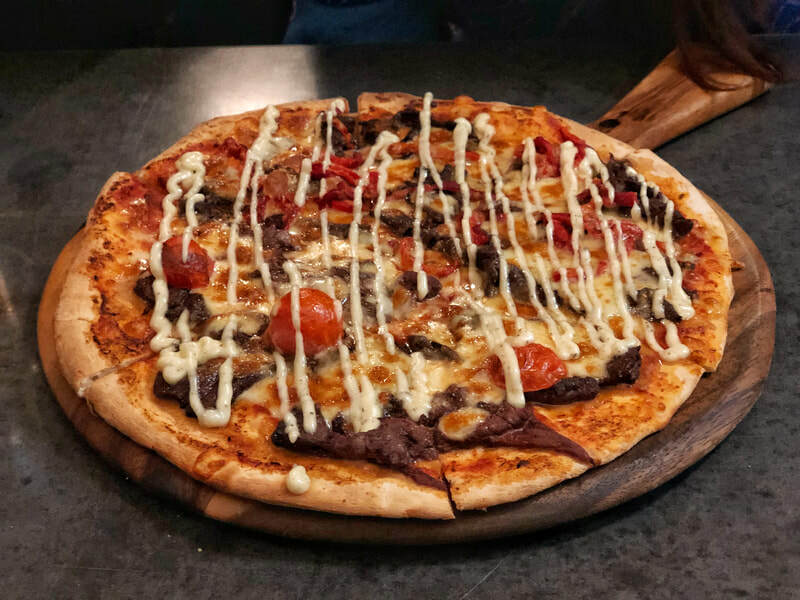 I took a bite of the kangaroo pizza and it tasted like beef just as the emu did. I was really scared to try it, but it is definitely worth going just to say you ate kangaroo and emu. The next day there are two places we went that were amazing. The first was a little stand right outside a mall and it sold meat pies. Kim said that they had amazing meat pies so she brought us there. It was almost like a deconstructed shepherd's pie. 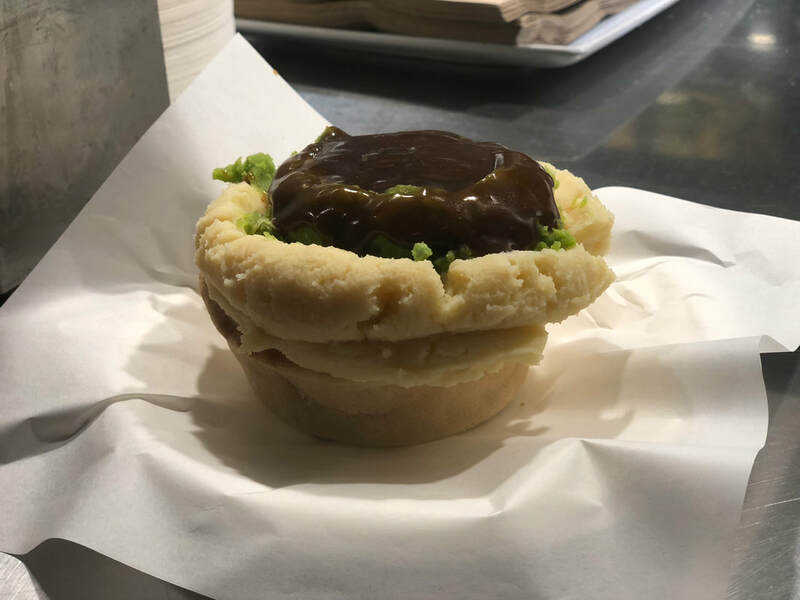 The meat pie was ground beef inside a puff pastry, with mashed potatoes, mashed peas, and gravy. Normally I don't like gravy on my mashed potatoes but this was amazing the gravy brought out all of the flavor in the mashed potatoes and peas. The meat was tender, but the only thing was that the puff pastry was a little too tough Overal the meat pie was amazing it was a great snack right before we ate dinner. We had dinner at this little cafe that was recommended by our friend Jimmy Wong who was a chef and he was meeting us at the restaurant. When we got to the cafe we met up with Jimmy and Jimmy’s partner Jay. We all sat down and ordered drinks most of us got this fruit juice, but it was more of a slushie with some of the fruit on top. I got passion fruit, my dad, Jay, and our other friend Nick got watermelon, and Kim got lychee. As a big fan of passion fruit it was soooo good. It was the best juice I have ever had it was refreshing and tasted fresh. There was no extra sugar it was just passion fruit. As we drank our drinks we ordered the food our order consisted of papaya salad, fried rice, pad thai, sea bass, and a spicy stew. The first dish we had was the papaya salad that was my favorite out of that meal. We got the mild for the papaya salad because Jimmy told us that the mild papaya salad was extremely spicy so the spicy papaya salad was out of this world spicy. Jimmy was right because when I took a bite of the salad my mouth started burning up and I had to drink a lot of my frozen passion fruit juice to calm my mouth down. Although it was really spicy it had lots of flavor and it didn’t have a flat flavor it was refreshing and really stimulated my taste buds. The fried rice and the pad thai were really good, but I have had pad thai and fried rice before so it wasn’t something I was swooning over like I was the papaya salad. Then came the sea bass it was super tender and they served the whole fish so we passed it around. The sea bass had a lemony flavor and was overall really tasty. Lastly was the spicy stew, there were potatoes in it and it was spicy, but it wasn’t as spicy as the papaya salad, but it was still really delicious. The base was coconut milk and it had curry powder in it. So it was very delicious. Overall the meal was absolutely fantastic and I had a great time with all of my friends. 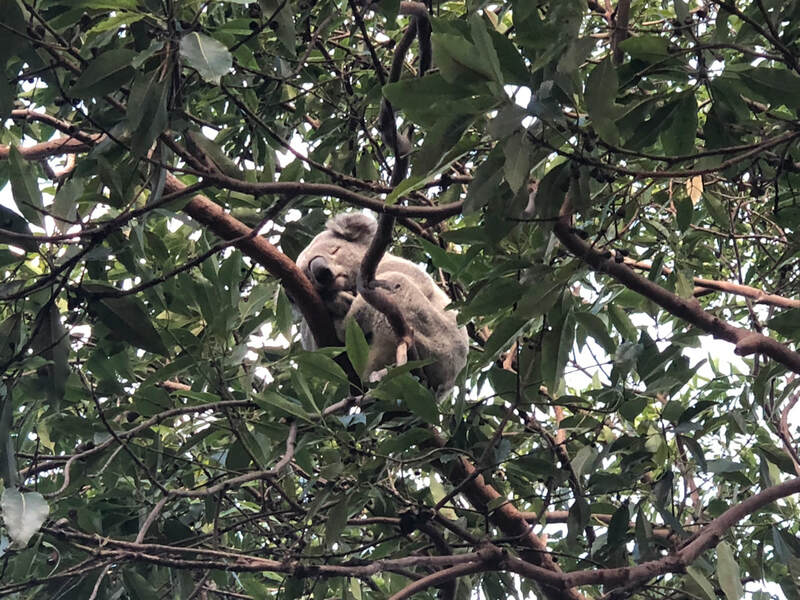 My dad and I had an amazing opportunity to go to Australia for my dad’s work. Of course while we were there we wouldn't just be doing work, we would also be eating our way through Melbourne and Sydney; the two cities we would be visiting. Let's start off with Melbourne. 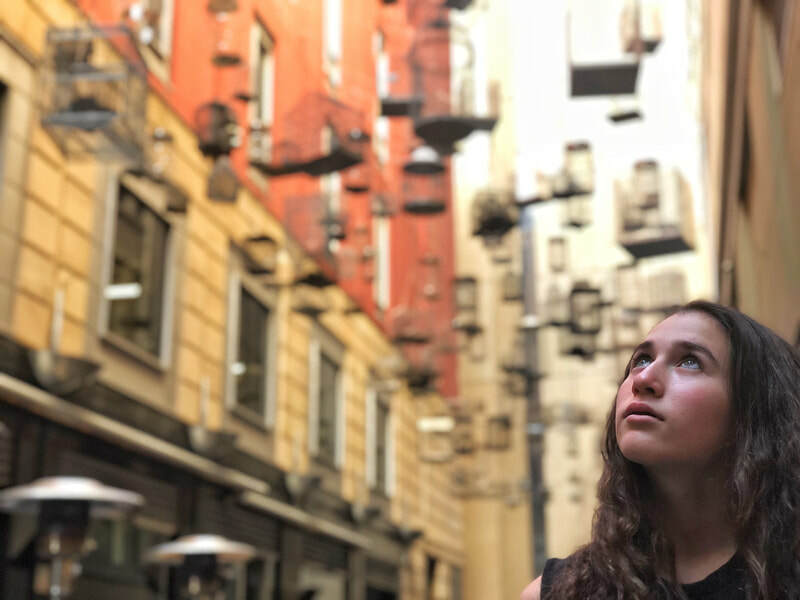 Melbourne is best known for its coffee and its food so of course in my mind it was the best city to go on this trip. 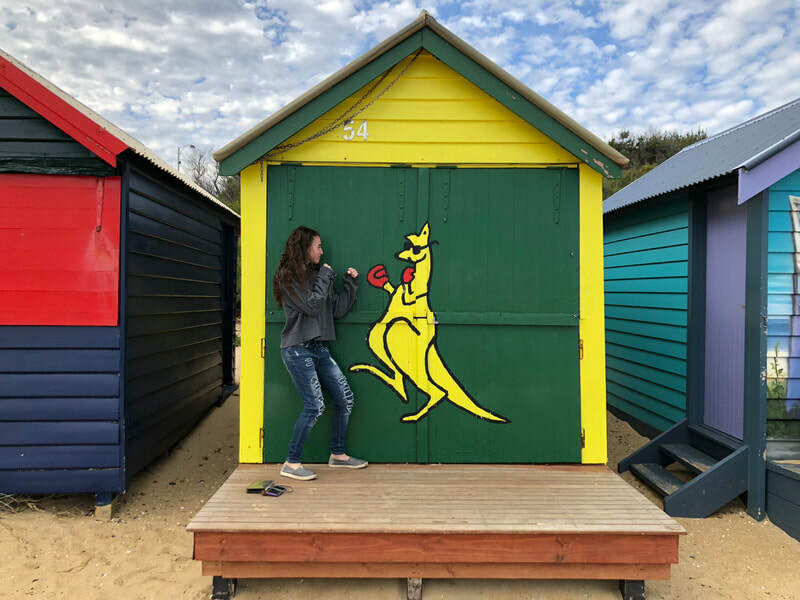 When we got to Australia we started our food adventure off right away. 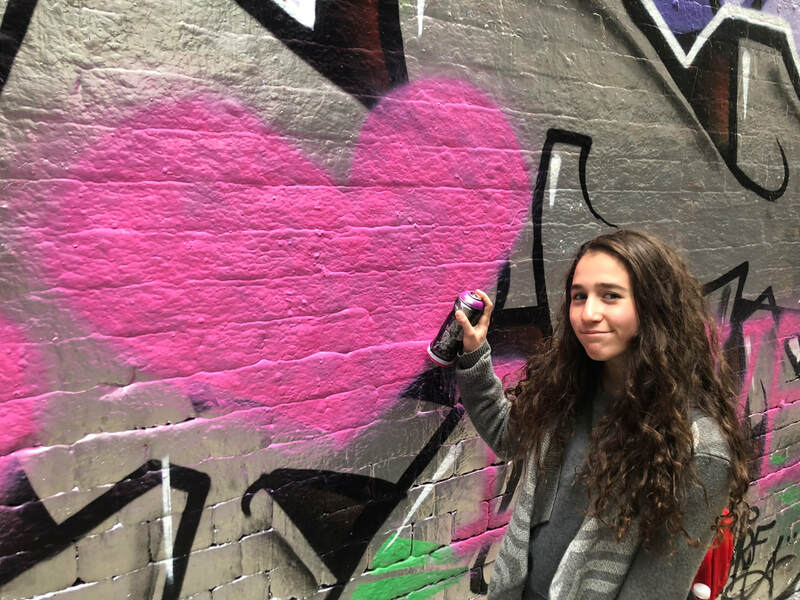 We made our way from the Melbourne airport to the Queen Victoria’s Market. Keep in mind that we just got off the plane and we had been through two days of flying with really terrible airplane food, so we needed some good food. Lucky for us we got some boreks right when we got to the market. A borek is a turkish bread that is stuffed with meat, cheese, and/or vegetables. I got the spinach and feta borek while my dad got the lamb borek. 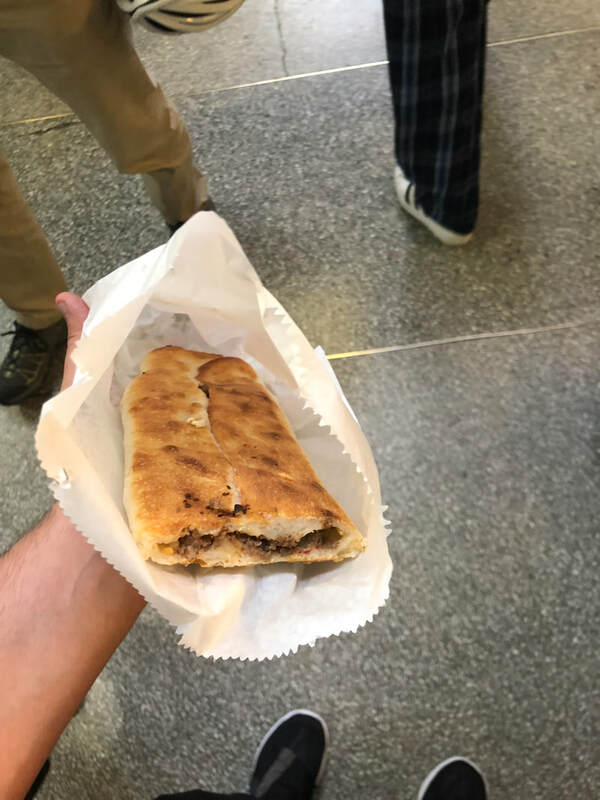 The bread which was the outer part of the borek, was almost like a flat bread and if you have ever been to Cosi, it is like that kind of bread. On the inside there was feta and spinach and it was amazing. The feta was all melted with butter dripping out if it and the spinach was cooked to perfection. The only thing that wasn’t good about it was that I didn’t have a second one. The next place we went to was a breakfast place called Lune and it sold croissants. It wasn’t just your plain croissant or your chocolate croissant they had a whole variety of flavors. There were a lot of different kinds of croissants, but we settled on three plus a hot chocolate that we shared. We got a yuzu flavored croissant, an almond flavored croissant, and lastly a kwan aman. Lune was a cute little cafe but it had a very big line. The first croissant we had was the Kouign Amann. It was a croissant, but it was coated in sugar and twisted to look like two spirals. It was the best croissant I have ever had it was so crispy on the outside, but it wasn’t burnt and it had a nice brown color. It made that satisfying crunch sound when you cut it with a knife. The next one we had was the yuzu croissant. It had a yuzu jam with a vanilla pudding inside as well. A yuzu is a citrus fruit that is sour but also kind of sweet as well. I thought that the crispiness of the croissant and the sweet and sourness of the yuzu jam really complimented each other. The almond croissant was next. It was very crispy on the outside and had a sweet thick almond paste in the middle it wasn’t overly sweet, but it also wasn’t super nutty at the same time. I also though the sliced almonds on the top of the croissant were good they gave an extra crunch they were also arranged in a pretty pattern. Unlike American hot chocolate this one was not sweet at all. It was just hot chocolate with no sweetners and it was just like hot chocolate should be; chocolate not sugar. The next few days my dad and I were at the first event he was working so we didn’t go to a lot of places at that time. 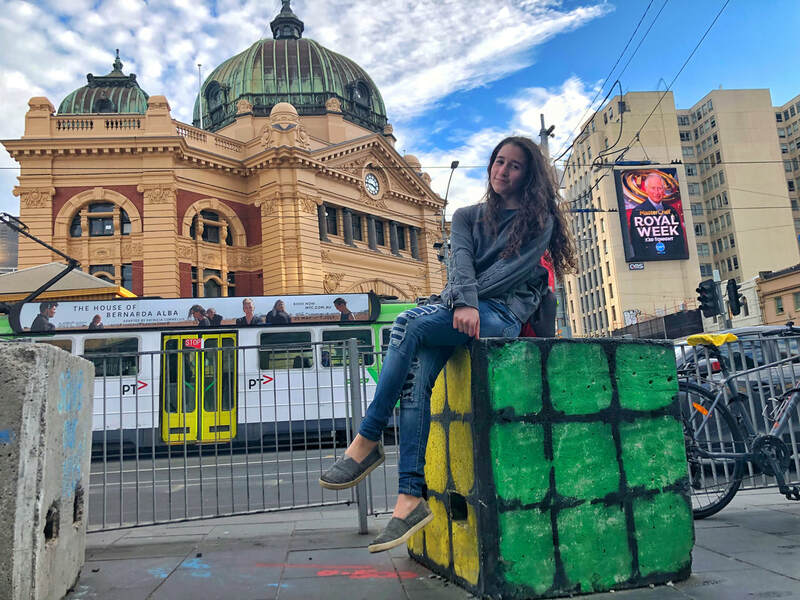 After the event we had two days to explore Melbourne and I know this might sound as if I am over exaggerating but those two days were some of the best eating days I have ever had. ​The first restaurant we went to was called The Kettle Black and we went there for breakfast. The whole place had a very nice vibe to it. 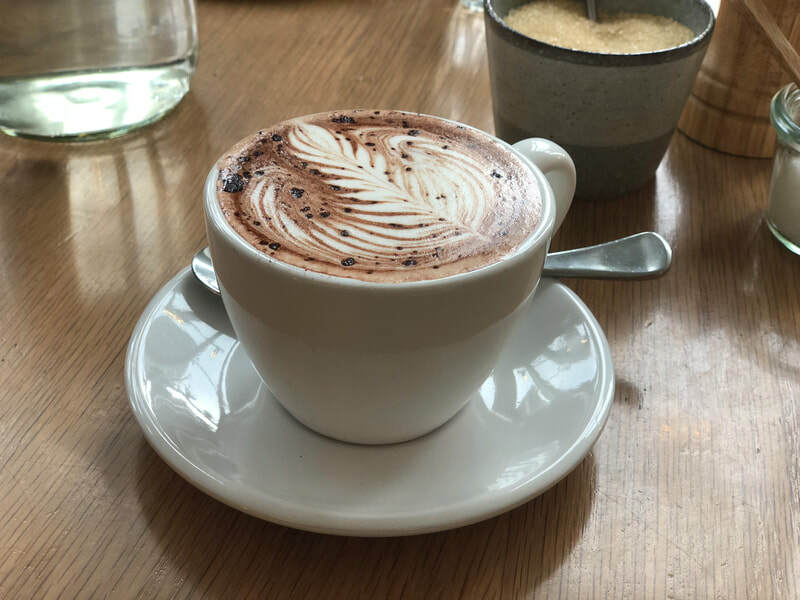 From our hot chocolate experience at Lune we decided to get hot chocolate again and we also ordered an indigenous tea that was recommended by our waitress. The hot chocolate was of course delicious and after all of that amazing hot chocolate I found it a little hard to come back to the overly sweet hot chocolate here. The next drink we had was the indigenous tea. The tea was a mix of peppermint and eucalyptus. It came out clear so it looked like it was just plain hot water but when you actually tasted it the tea was so refreshing and calming it was nothing like any tea I had ever tasted my dad and I loved it so much we actually bought a little bottle of the leaves to take home. For our actual breakfast we got ricotta pancakes and chili oil crab eggs on top of sourdough toast. Let’s start off with the pancakes. We actually had to order the pancakes right away because they take a little longer than everything else, but it is extremely worth it. 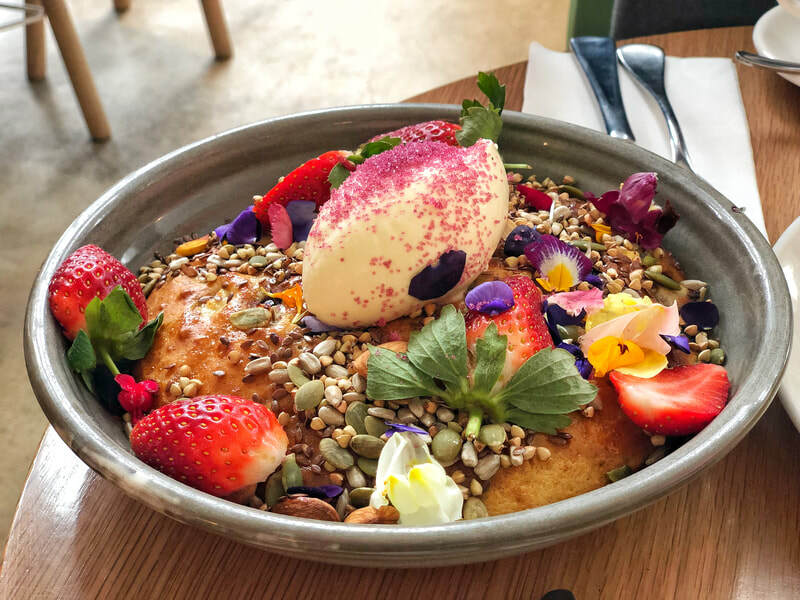 The dish was one humongous pancake, it was topped with maple butter, purple sugar, nuts, seeds, fresh fruit, flowers, and had blueberries on the inside. I am sorry if I am making your mouths water but mine is watering as well even thinking about it. We rubbed the maple butter all over the pancake so it could soak up that maple buttery goodness. Then, we dug in and we destroyed that pancake until was nothing left at the end except the flowers and some crumbs. The mix of the creamy maple butter, fresh fruit, and crunchy nuts was amazing. All of the textures and flavors went hand-in-hand perfectly. 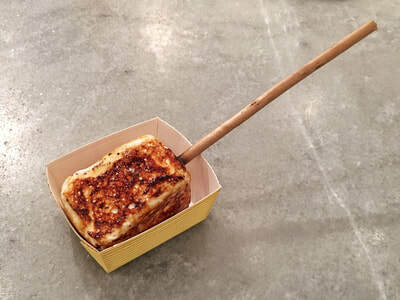 All of the ingredients were super fresh and the pancake itself was extremely fluffy from the ricotta. Next, were the eggs, to be completely honest I was not on board with the eggs at first because I like more of the sweeter breakfast foods in the morning. 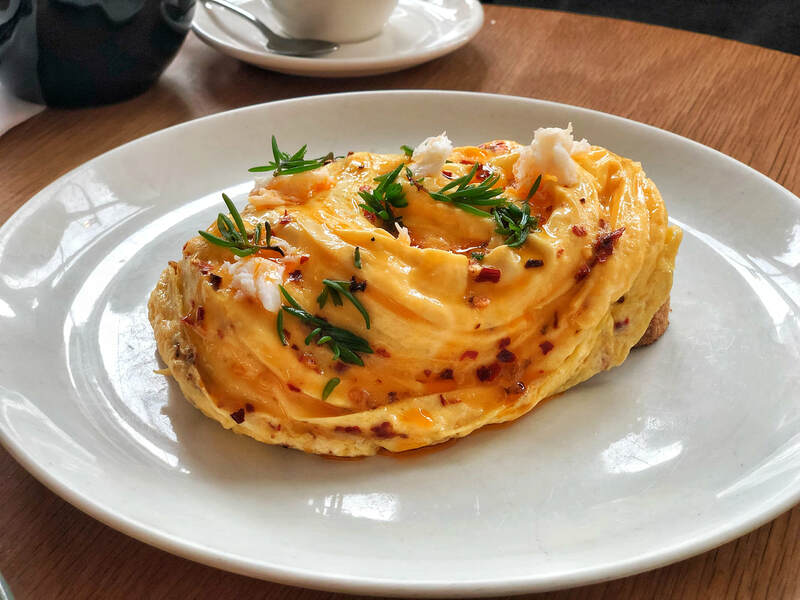 These eggs were the best eggs I have ever had and that is saying a lot because as I said I don’t really love eggs. These eggs were really spicy from the chili oil and extremely soft. I didn’t really taste the crab, but the eggs on top of the sourdough bread were awesome. You got the spicy, sour, and salty of the dish and the crunchy, soft textures. Overall it was an amazing breakfast. After we had breakfast we met up with our friends Lindsay and Anthony and we did some sightseeing and then Anthony dropped us off at our next food stop. It was at a very famous restaurant named Chin Chin. We got really lucky because usually Chin Chin is super packed, but we got to walk right into the restaurant and get a table. Even though we got a table the entire restaurant was still extremely crowded, but it had amazing style. Near the kitchen there was a humongous pink bunny that lit up and it brought a lot of style to the restaurant. From Chin Chin we got three dishes. Beef and noodles, string beans, and lamb. We felt like we had to get lamb because we were in Australia which is known as one of the best places to eat lamb. The first dish was the beef and noodle dish. The beef was bursting with flavors, and the noodles were shorter than normal noodles and they were super soft and a little slippery. They were more like rice cakes. The next dish, the string beans, was my favorite. They were tossed in a chili oil and the oil brought so much flavor and depth to the dish. I think chili oil is my new favorite ingredient, it was good in everything. The last dish was the lamb. I have never been the biggest fan of lamb, I would always try it, but it never was something that I favored. This lamb was super tender and it wasn’t really gamey. The whole dish was very powerful and had a humongous punch of flavour. It was overall an amazing meal that filled us up for our adventures until dinner. For dinner we went to a restaurant named Tonka. It was an Indian fusion restaurant and it was located in a little alleyway kind of tucked in, but this place was hopping. Just like at Chin Chin, we got the last available table. We really lucked out that day! We sat at an elevated table with elevated chairs, the kind of chairs you would see by a bar. 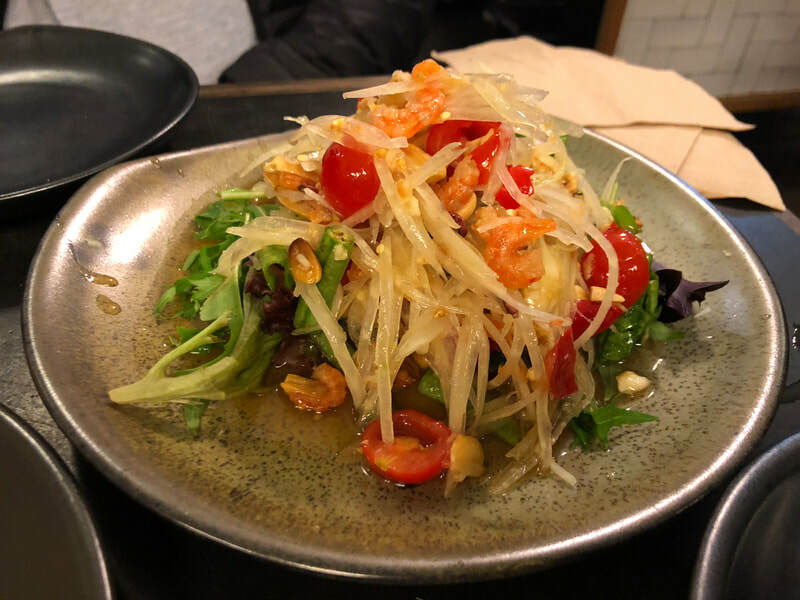 We had a lot of food at Tonka, but overall there were two dishes that stood out to me the most. 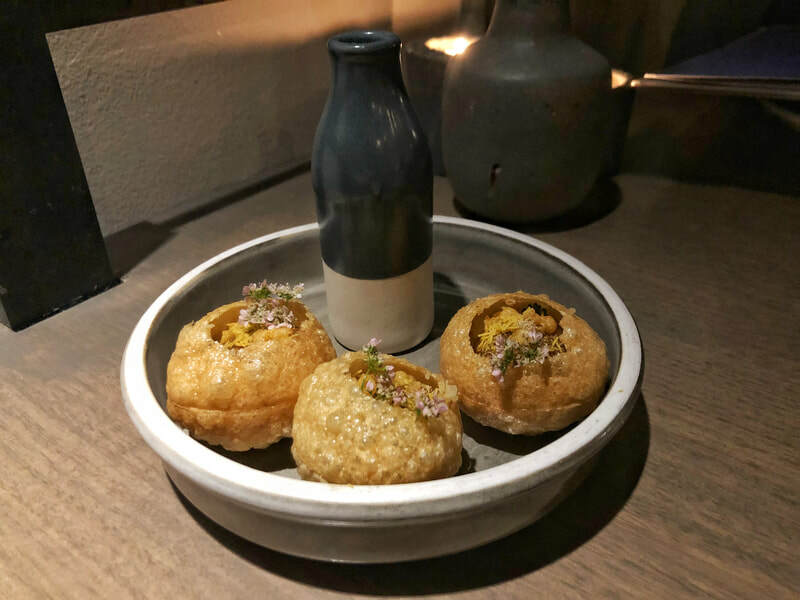 The first was a crispy pastry shell and inside were curried vegetables served with a little glass of aromatic water. The waiter told us to pour the water into the shell and pop it into our mouths for the best possible experience. We poured the water into the shell and popped it into our mouths. 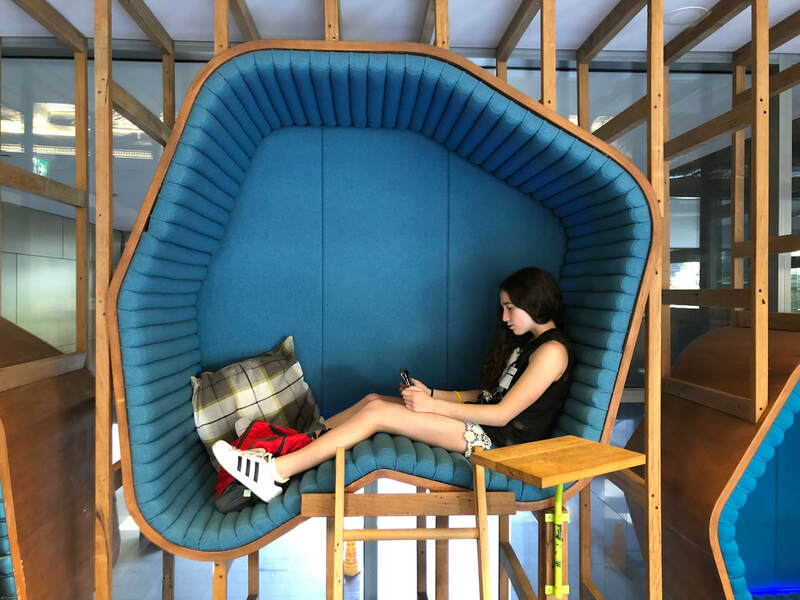 For me there was a little technical difficulty because the shell was a little too big and I didn’t have enough room to chew, but I figured it out and it was amazing. 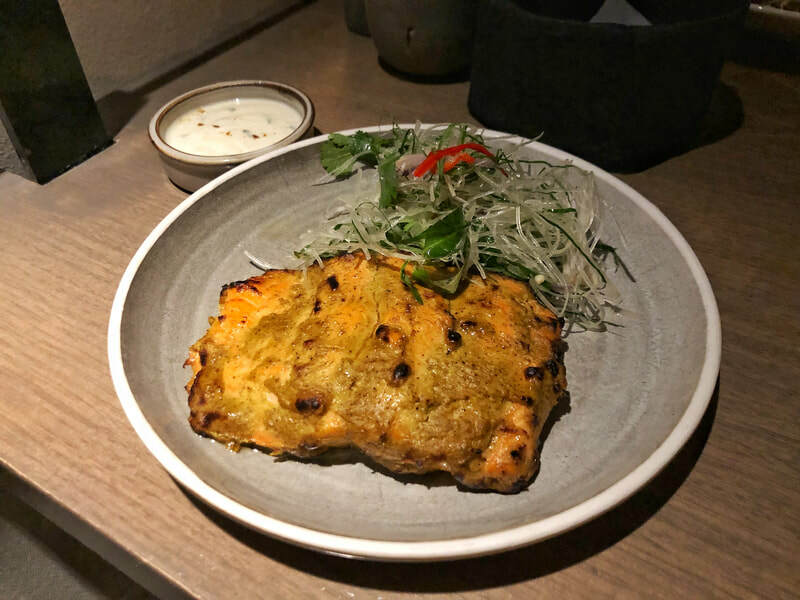 You got the spiciness from the vegetables, the crunchiness of the pastry, and the taste of the aromatic water went perfectly with the dish. The next dish was definitely my favorite of the dishes we got at Tonka. It was a lamb curry with jasmine rice and naan. 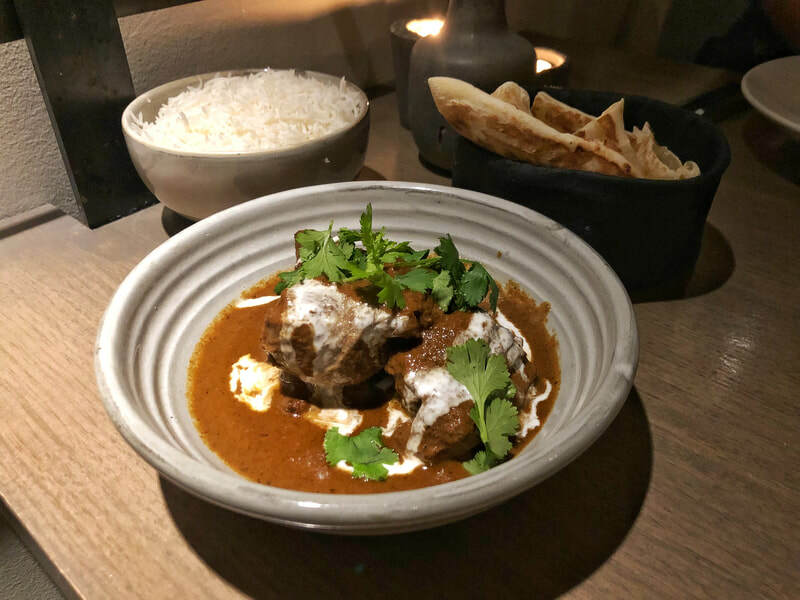 The lamb was so tender and the curry gave it bursts of flavor and when I was done the curry had soaked the rice and of course I dipped the naan in the curry. Just like at Chin Chin, the lamb wasn’t super gamey, but it still had nice flavour. Out of all of the restaurants we went to Tonka was definitely my favorite. After everything we ate that day we decided to grab some dessert before going back to our hotel. We went to a place called Om Nom and we were there for one thing. The Dessert Cigar!! 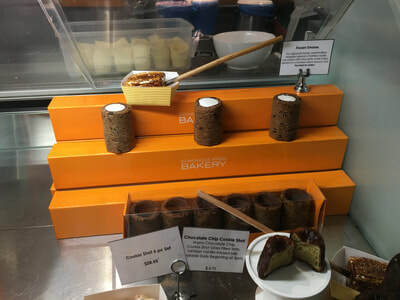 It was a completely edible cigar that was made of chocolate had a chocolate filling, and you dipped it into raspberry jam and chocolate ashes. They served it to you in a wooden box and the smoke that came out of it was rosemary smoke. The raspberry and the chocolate ashes balanced each other out because the rasberry was sweet and kind of sour and the chocolate ashes were bitter. 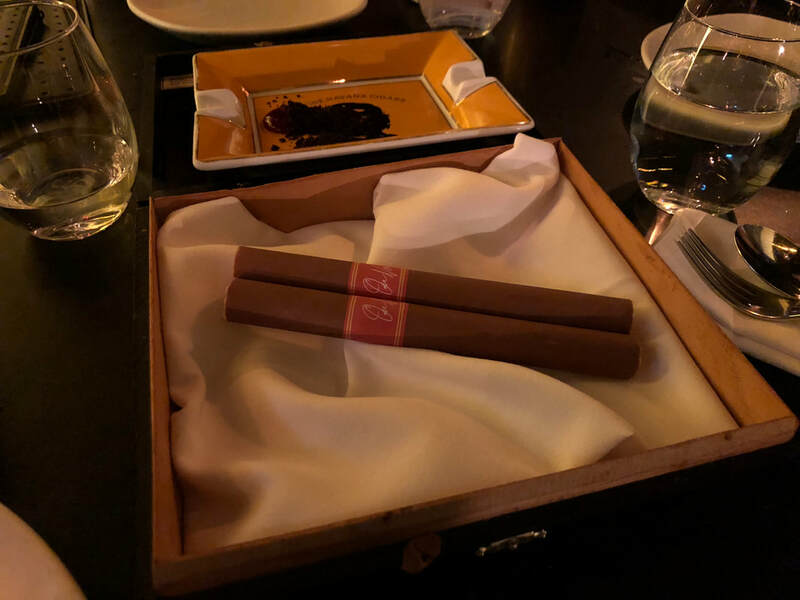 The actual cigar was amazing. It was a chocolate shell filled with a chocolate mousse. The next day we got ready to leave for Sydney, but we needed to bring food onto the plane and what better to bring than macarons and sushi. We got the macarons from a famous pastry chef in Australia, Zumbo. He is super famous and his bakery was named Zumbo. We got the salted caramel and the cookies & cream macaron. The macaron was crunchy and chewy and the fillings were both super smooth. I usually don’t have macarons that often, but these two were definitely one of the better ones. In Australia they have sushi stands on the streets it is basically fast-food sushi. There is a display glass of whole sushi rolls not cut up and just the entire roll, and you pick the ones you want. They put it into a plastic container for you and BAM you have sushi. One of my favorite TV shows is called Top Chef. In one particular season, there is a chef named Brooke Williamson and she was my favorite chef on the show and I was rooting for her to win for the entire season. Brooke ended up winning and ever since she won, I really wanted to go to her restaurant in Los Angeles called Playa Provisions. My dad and I had a 9 hour layover in LA on the way to Australia and we decided to go to Playa Provisions. 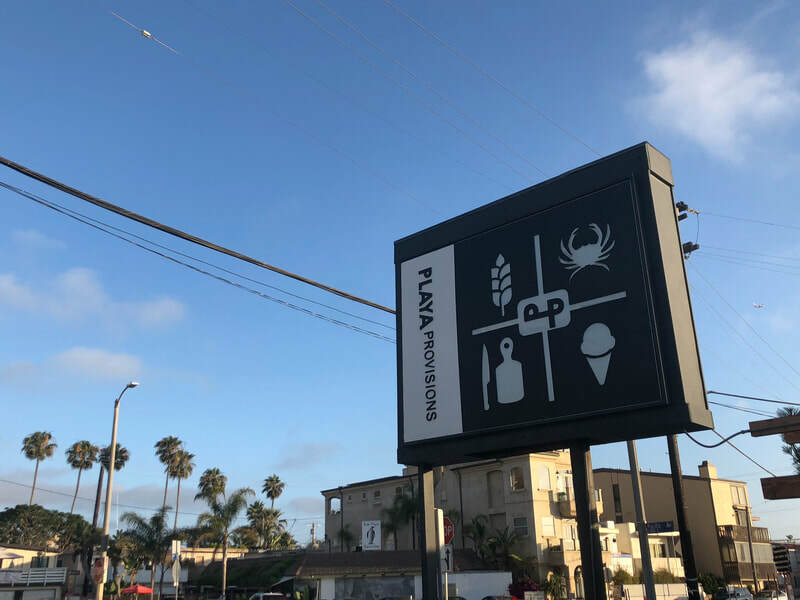 Playa Provisions is a seafood restaurant in Playa Del Rey and is right next to the beach. 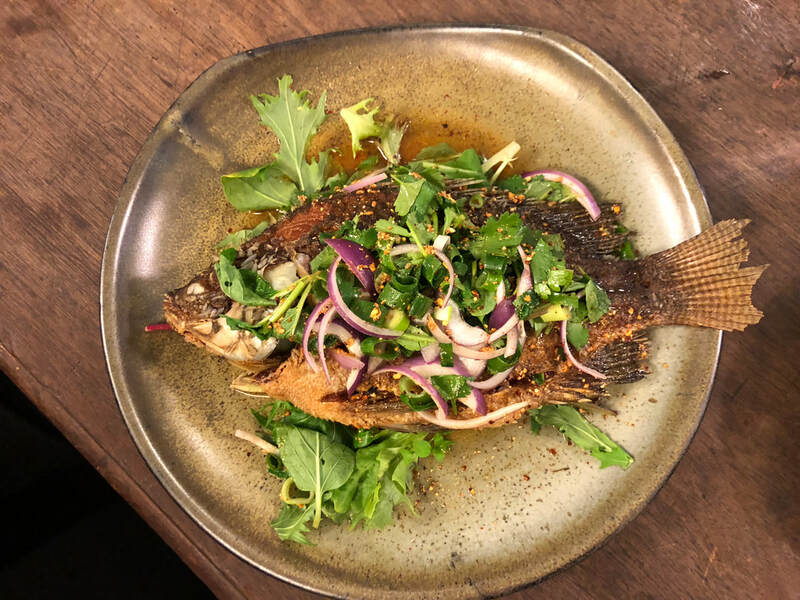 Brooke owns many restaurants including Da KikoKiko, Hudson House, and Playa Provisions. When we arrived they led us to a special room because we were meeting family there and there was a lot of us. The restaurant was beautiful and felt like a very fancy beach house. When all of our family arrived we ordered our food. As some appetizers we got assorted pickled vegetables, fried calamari, and biscuit bites. The first thing to come to the table were the biscuit bites. It was a tiny biscuit that came with dulce de leche on the side. I opened up the biscuit and spread the creamy lush caramel on. When I bit into it, I got all sorts of flavors and textures rushing towards me at the same time. I tasted the creaminess and sweetness of the dulce de leche and the moistness of the biscuit. It was the perfect way to start off the meal. The calamari and the pickled vegetables came next. Let's start with the calamari. The calamari was so crispy and tender, when I dipped it in the cocktail sauce it gave it a nice sweet tangy flavor. The pickled vegetables were a little sweet, but also obviously sour. There were three vegetables that we tried cucumber, carrot, and cauliflower. My favorite was the cauliflower. It was my favorite because cauliflower usually isn’t a pickled vegetable that I’m used to and it was very delicious. It wasn’t as overpowering as the other vegetables. I thought that they came in a very cute jar and was delighted that they didn’t come on a plate. For our entree, my dad and I shared a lobster roll and fish tacos. 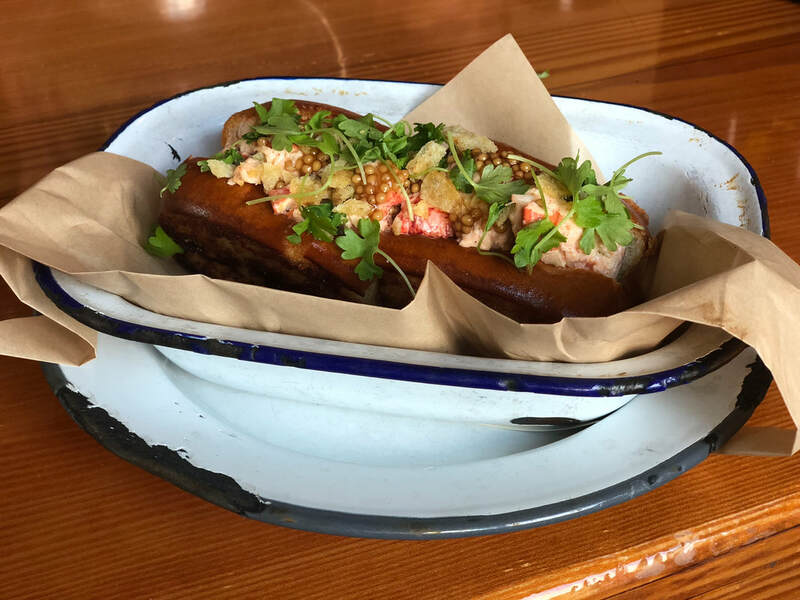 The lobster roll was my favorite of the two it had a crispy bun which is sometimes hard to have because the lobster makes it soggy. The lobster was cooked perfectly and was bursting with flavor. The mustard seed on top really helped enhance the flavor. 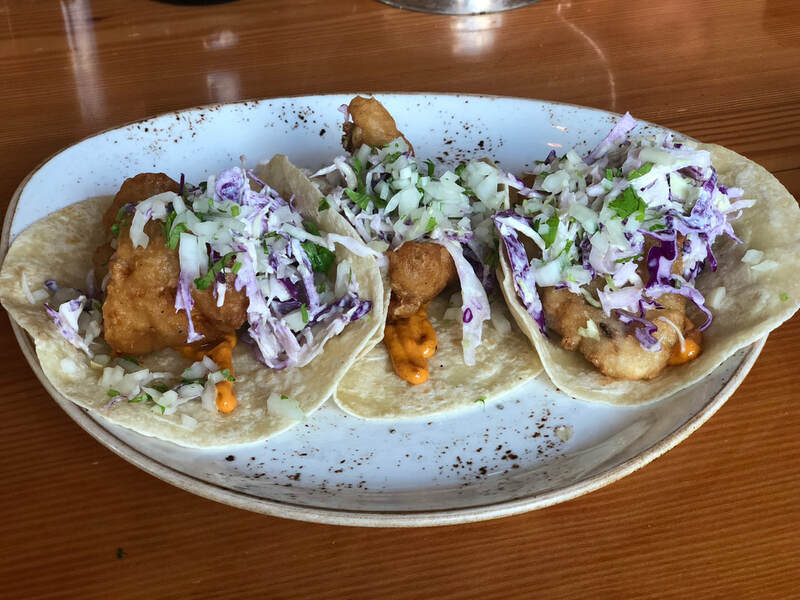 The fish tacos were also very delicious. On top of the tacos there was a very nice refreshing relish that brought so much flavor to the dish and really elevated the fish’s flavor. Overall it was a very good meal and I would definitely go back. I am also hoping to get the chance to interview Brooke in a few months and I can’t wait to share it with my readers! 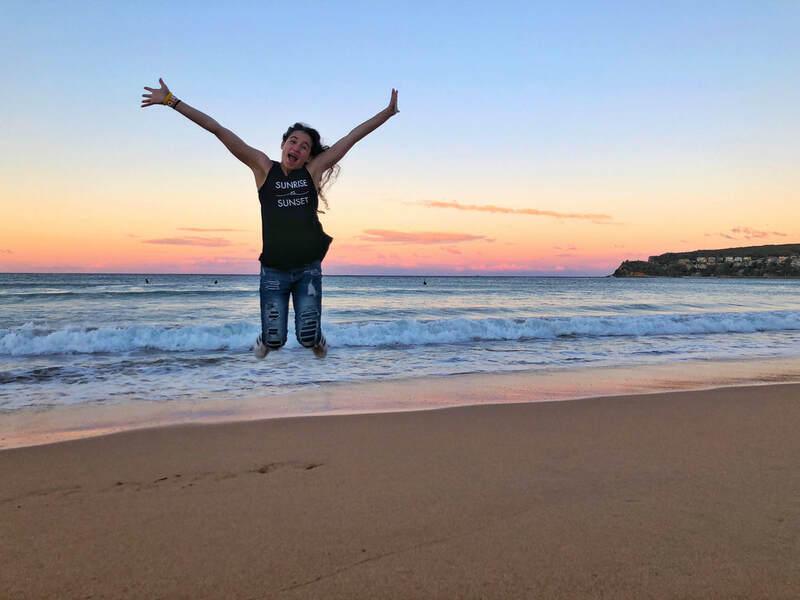 My family loves going on vacation and, let's face it, who doesn’t? Usually we like to go on cruises out of New York but this year we were going on a cruise out of Seattle to Alaska! We also were going to spend a few days in Seattle. As usual, we had some good eats planned for both Alaska and Seattle. The first place we hit up was right after we had gotten off our six hour flight from New York so we were all very tired. The place was called Dong Thap Noodles and was in the International District of Seattle. They were famous for having the world’s biggest bowl of pho. 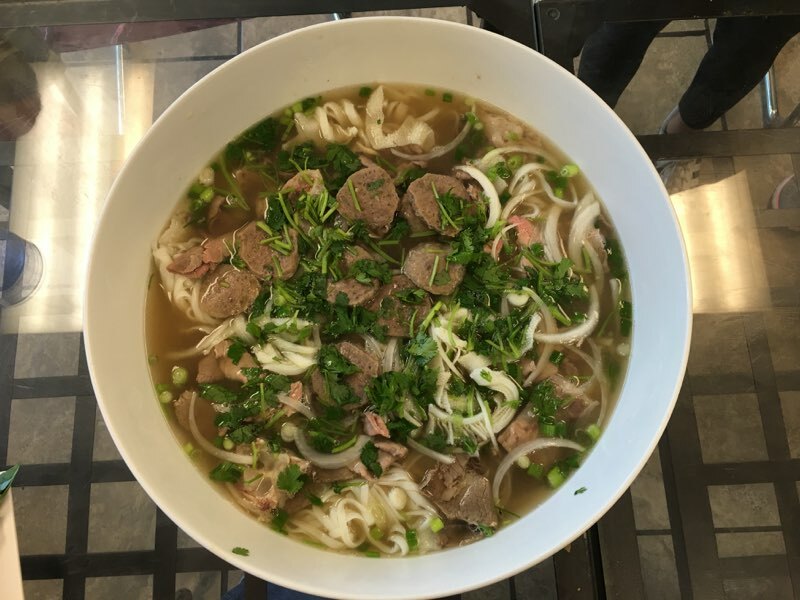 Now, as you probably know from one of my earlier posts we visited Vietnam a few years ago and had pho all of the time, but since then I have only had one or two bowls of it in the States. So, I was excited! We started off by getting spring rolls and egg rolls and obviously we ordered the pho. The spring roll was my favorite out of the two rolls it was so fresh and light and it really tasted like I was back in Vietnam. Next was the pho. It was huge! As soon as we got it we dug in, of course, after my dad took pictures. In my family, we put sriracha, hoisin sauce, jalepeños, and bean sprouts which gives it a lot of bold flavors. It was the best pho we had eaten since Vietnam and it reminded me a lot of Vietnam. We actually tried a few new things that were in the soup which were tendon, and tripe. I thought that the all of the different meats were cooked very well and that all of the flavors really went well together. The owners of Dong Thap were so nice and were so involved with the customers which I usually don’t see a lot of and is something I really appreciated. Overall, I think it should be a place you try to go to if you go to Seattle. 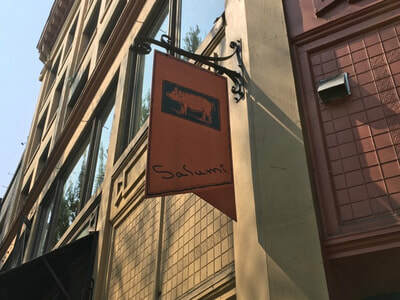 The next place I want to talk about is a very famous sandwich place that is owned by Mario Batali's parents and it is called Salumi. It was opened after his dad retired and he decided to learn a lot about curing meats, which eventually led him to open his store. His store is only open four days a week from 11am to 3pm so this was our only chance to go. We got there as the store opened and it isn’t really a sit down place. You get your order to go. 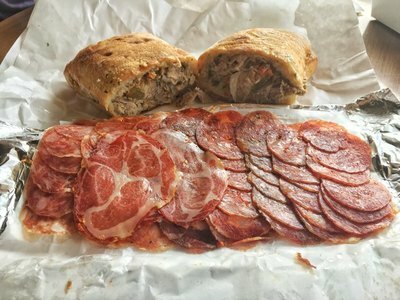 My dad and I agreed on getting the porchetta sandwich (one of the most popular sandwiches there), chicharones, meatballs, and the cured meats platter. We took it on a mini ferry trip, we were taking around Seattle. We started with the porchetta sandwich which had pork, peppers, and onions. I must say it was a very good bite. The pork was tender and the peppers were soft and so were the onions. The only thing I would say was that the bun fell apart when we ate it. The next thing we had which I could not stop eating was the meat platter. It had all of these different types of salami that made my mouth water. There were six different types of salami: finocchiona, hot sopressata, salumi, mole, mustard, and agrumi salami. My favorite salami that kept reeling me back was the mole salami, it had a lot of different flavors and it was a hard salami which I love. They had put nutmeg in the salami which was interesting because I would expect it in a mole, but I wouldn’t think it would be good in a salami, but it was. It had made the salami pop and stand out from the others. We had gotten two orders of the meatballs which is the next thing we are going to talk about. I am really glad we got two orders because if we didn’t there wouldn’t be enough to go around!! To me the meatball itself is only 75% of what makes a meatball really good and the other 25% is the sauce. Meatballs need to be moist and I like my meatballs soft and the sauce really helps to kind of of trap the moisture in the meatball and make it dense. If the sauce that is helping to keep the meatball stay moist isn’t good then there is that 25% of the meatball gone. I don’t care if it is the best meatball in the world. If that sauce isn’t good then it is over. I thought that they nailed the sauce and that the meatball was nice and moist and the sauce really helped bring the meatball to the next level. Lastly, I thought the chicharones were very good, but it was a little hard and that might just be me because of my braces. Although because it was a little hard it really brought out rich flavors in the chicharones. I also thought it was very nicely seasoned. I would definitely go back to Porchetta and so far I am in love with Seattle. Then we were off to Alaska!!! We did a lot of excursions in Alaska so we didn’t have a lot of time to eat. The only place that we ate was in a little town called Skagway. One of our excursions there was a salmon bake and then we ate in the town. Skagway was a short walk from the docks of the cruise ship and I wish we got to do more exploring there. We ate this dessert that was a fried bread coated in sugar and tasted like fried dough which it was just not over the top sweet, but more subtle. The salmon bake was not what I was expecting. We took a little bus there from the docks and it wasn't even in Skagway, it was a bit little outside town. 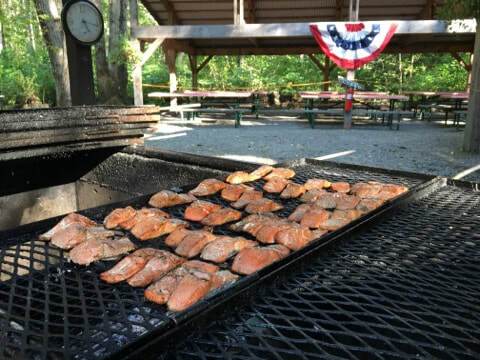 We showed up in a little school bus and there was a little buffet set up with salad, pasta and next to it was a large grill with salmon and a pineapple glaze. It was nice, but it wasn’t what I expected. In Alaska we also got to go on a crab boat and see how they caught crabs. 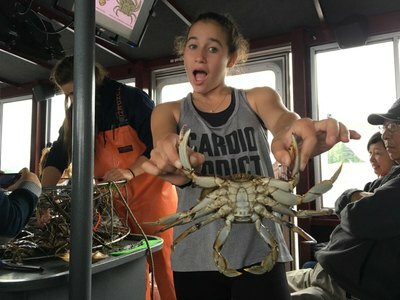 We also learned the difference between female and male crabs and I got to hold a crab. It was fun, but my favorite part was going back to land to eat as many crabs as we wanted. When we got there they told us that there was a competition to see who can stack the highest crab shell pile and the winner would get a prize. If you know me then you know I am super competitive so I was all in. 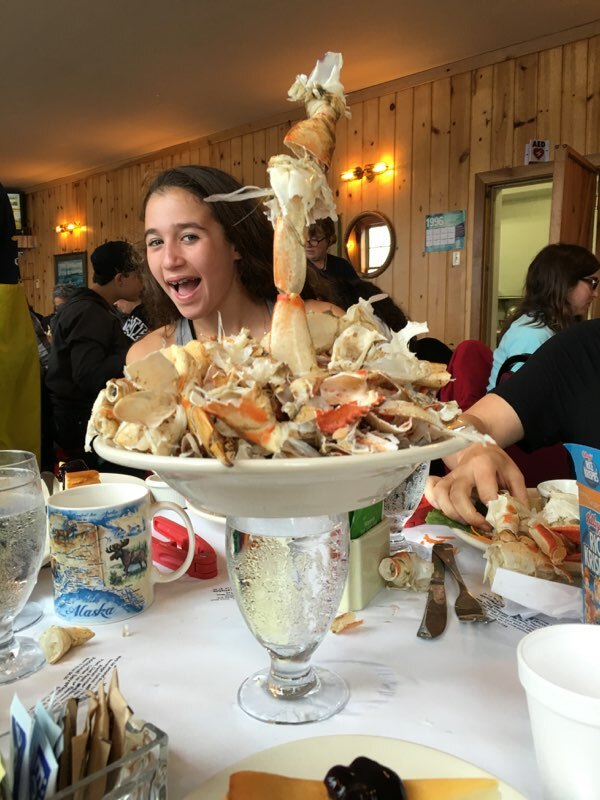 Compared to other groups though we didn't have a lot of people since my siblings don't eat crab and we only had four people actually eating crab. So we were the most creative when it came time for them to measure our stack of shells. We put the plate on top of a glass and so even though we didn't have a lot of shells on the plate it still put a lot of height on it because they measure it from the ground. We actually won!! Do you want to know what are prize was? We got to learn a dance. I know, not much right? It still felt good to win. That was our last day in Alaska. Then it was back to Seattle! 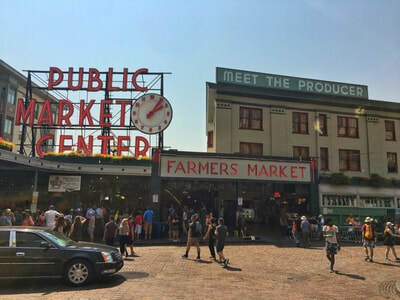 We didn’t go straight home after the cruise, we decided to stay and explore Seattle a bit more. As soon as we got off the ship we went to a Mariners game because my Dad has always wanted to go to that stadium and the food there was supposedly amazing. There were a few major things on our list to eat there, one of them was to eat these fried grasshoppers that came in a little container. I was really nervous to eat it because, like to anyone, it sounded disgusting. We went on the line as quickly as possible because they only sell a certain amount of containers per day. There was plenty left when we got there and my Dad and I asked what the grasshoppers tasted like and the guy working there said they tasted like hearts of palm. Now, hearts of palm aren’t my favorite food and I don’t love them so I was very hesitant to try it. I did end up eating it and it tasted disgusting, but I made it down. I am glad that I ate it because now I can say that I ate a grasshopper. The last place we went before going back to New York was the Pike Place Market. We got a lot of food there, but there are a few that really stood out to me personally. One of them which I still can’t get over which was this stand called Chukar Cherries. They are different types of cherries that are dipped in different types of chocolate. They were so good that we brought two bags home and one of the bags I ate by myself. The next thing we had were different types of clam chowder. 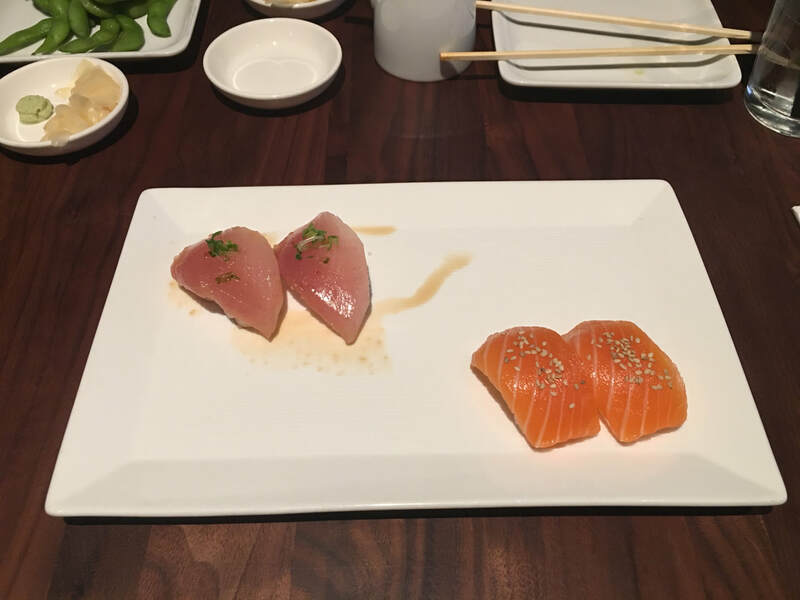 One was original and the other was mixed seafood and salmon. They were amazing they were so creamy, and full of rich flavor from the seafood. It was really hot that day and a really long line, but totally worth it. To cool ourselves down after the hot soup we got ginger beer. They are really good for you and you can get them in different flavors. We got peach, mango, and guava. My favorite was the guava. It was absolutely bursting in flavor and had a little bit of a kick from the ginger. 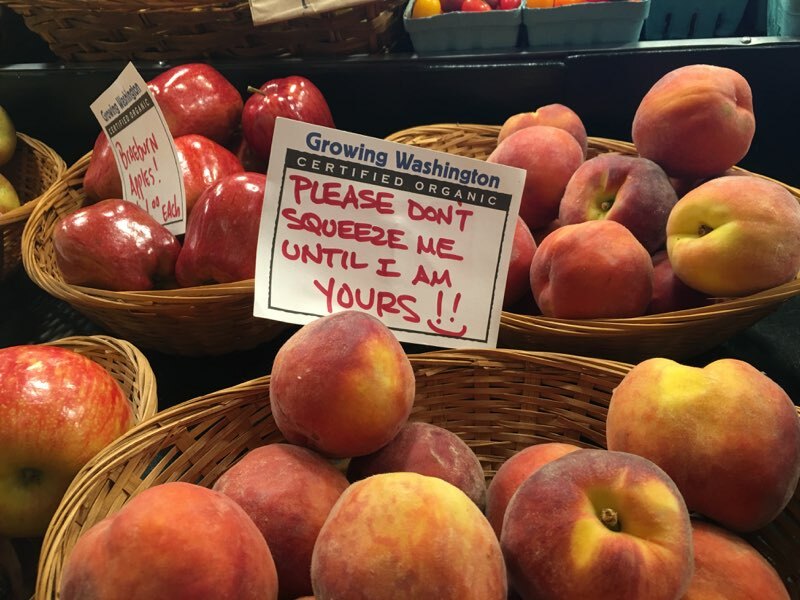 The Pike Place Market was definitely one of my favorite places and I am dying to go back. ​I am so grateful that I had the opportunity to go to these places and all of the food was amazing. I love barbecue, especially in the summer. The sweet smell of pork, or beef roasting on your deck and your first bites of succulent, tender meat. Now, I am going to apologize because everyone who is reading this is probably drooling or about to be drooling. Barbecue is eaten all over the country in many ways. Some people have different bases for their sauces or cook theirs at a different temperature than others. Although, it might all seem the same to you it isn’t. 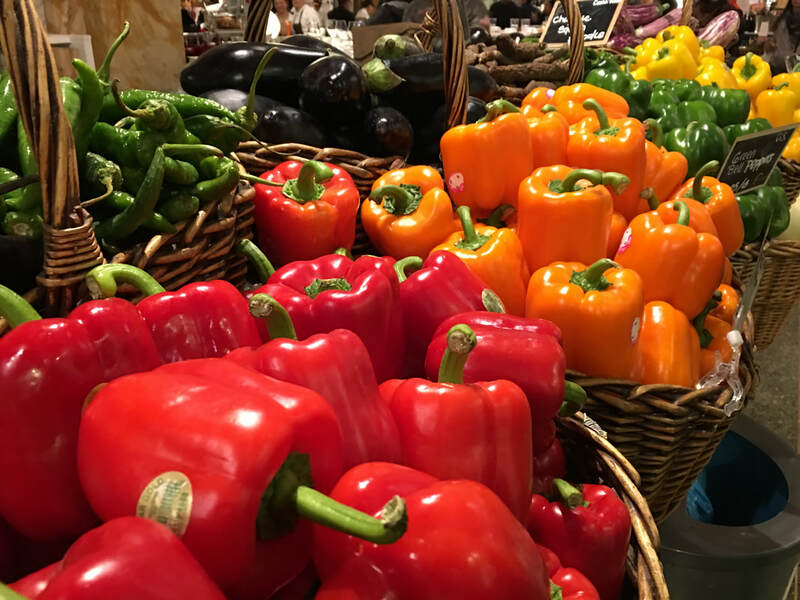 It tastes different, smells different, and is prepared differently. One of my dad’s friends Chris (everyone calls him Crafty though), is a barbecue judge! He is from South Carolina and judges barbecue based on a few things: taste, smell, and how the chef prepared it. 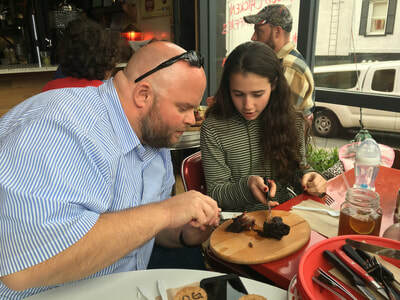 While he was in New York, we took him out for his birthday to Pik Nik BBQ in Tarrytown where he gave me some tips on barbecue. 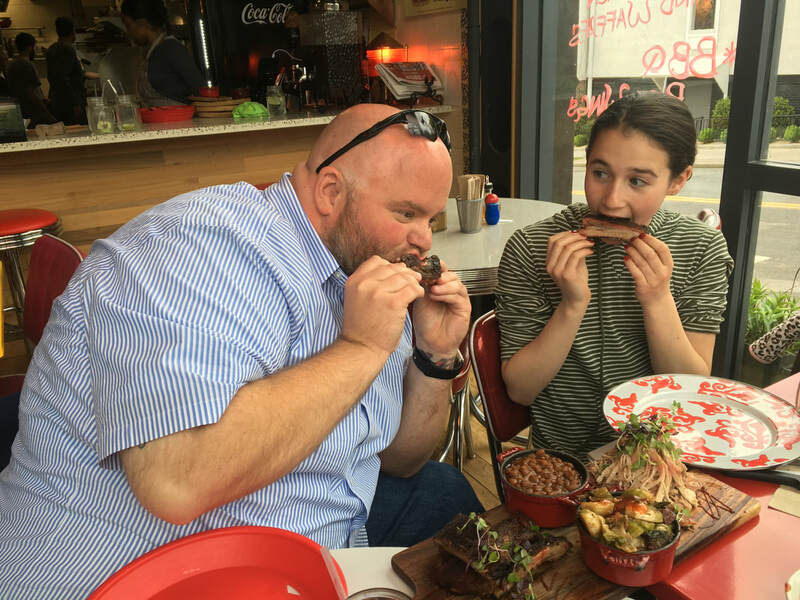 When I got there, we sat down and he told me something that is the number one priority for good barbecue: Low and slow, not high and fast. What that means is you cannot rush the barbecue. You have to put it at a low temperature so the meat can cook and also kind of fall apart when you eat it. When you cook it on a high temperature, it doesn’t get to really absorb the sauce or break down. On the other hand, when you cook it on a low temperature, the opposite thing happens. It breaks down and it absorbs the sauce. 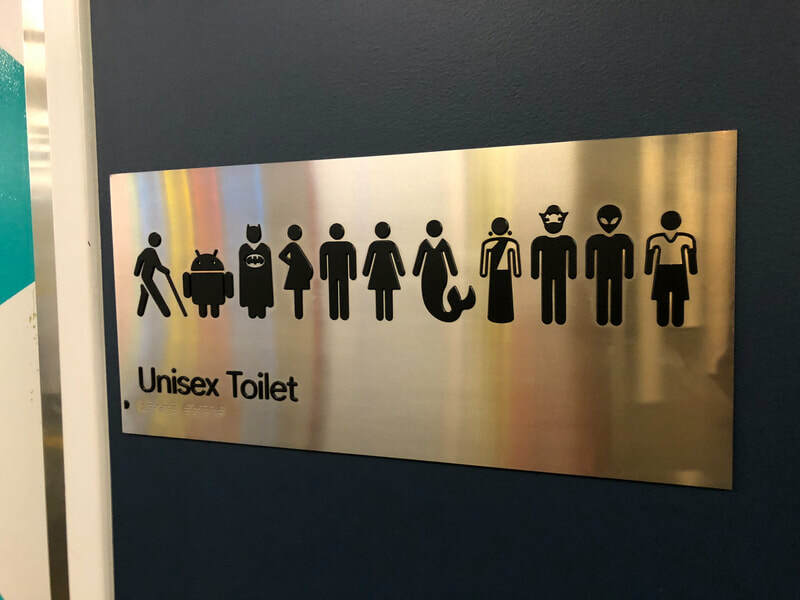 Now which option would you pick? For me, I would definitely pick the second option. After Crafty talked to me about how to cook barbecue, we ordered our food and drinks. For drinks, we got South Carolina Sweet Tea. Then, for dinner we ordered burnt ends, pulled pork, brisket, and ribs. The sides were brussels sprouts and bacon, baked beans, and mac & cheese. Now I know that you might think that South Carolina Sweet Tea is just normal tea, but it is very sweet and is a popular South Carolina drink. It is delicious!!! It is exactly what it is called. It is really sweet, but not too overpowering which makes it delicious. Shortly after we got our drinks, we got the burnt ends. I was so excited! My favorite thing to eat if we are having barbecue is burnt ends. Pik Nik doesn’t have burnt ends on their menu, but they gave us some that they happened to have in the back. Crafty told me as they got to the table what we were looking for in good burnt ends. We smelled them as part of the procedure and then we ate them. They were delicious! They melted in your mouth, and if you let it sit in your mouth you would be able to savor the succulent pieces of heaven in your mouth. It was delicious and Crafty agreed we both thought they were absolutely delicious. As we finished the delicious burnt ends graciously given to us by our waiter, the ribs came out. We again followed the procedure and when we tasted the ribs they were super good, but Crafty did say that there was some membrane that was under the bone which you can eat, but is just not something that they look for in good ribs when they are judging. Besides that the ribs were awesome and I recommend getting them if you go there. 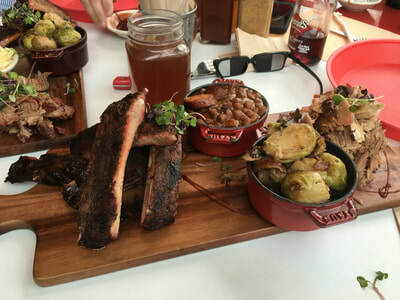 After the ribs, everything else got to the table: the pulled pork, the brisket, the bacon and brussels sprouts, mac & cheese, and finally, the baked beans. The brisket was very good, but sadly I only got a little taste because it was a big hit at our table. I enjoyed the pork a lot. The only thing I have to say is that it was a little dry, but the ketchup based sauce on the table made it very good and moist. Now, we have the sides. For some reason, sides always seem the most exciting part of the menu. Sometimes I get a dish because it has such an amazing side. Weird, right? Anyways the sides were amazing, I think we got the best sides on the menu. The brussels sprouts in the brussels sprout and bacon dish were very crispy. The bacon was also very crispy and they both went very well together. The mac & cheese was amazing!! It was ooey and gooey and the crust of bread crumbs on top was a wonderful pairing, as well adding another level of textures. The last side was the baked beans. It was the best side! It had chorizo which added a lot of flavor to it it. Overall the sides were amazing!!! Pik Nik had very good food, and I thought it was very kid friendly. I would love to go there again and I think you should too. Of course, since it is a break this week my Dad and I have to do a food crawl in the city. 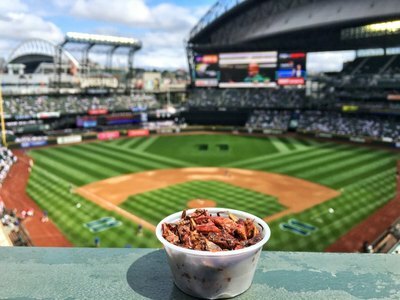 What’s a food crawl? It’s a full day packed with food. We start in one spot and go from place to place walking and eating. Our plan for this year was to start at Dominique Ansel. Next stop would be Dō, a place that sells raw cookie dough. Then we’d go to Ippudo for ramen, Sugar Fish for sushi, Beechers (the home of The World's Best Mac & Cheese), Eataly and Donut Plant. As you can see, there was a big day of eating ahead of us. My Dad and I both agreed that we would split everything because if we each got an individual portion it would be too much. 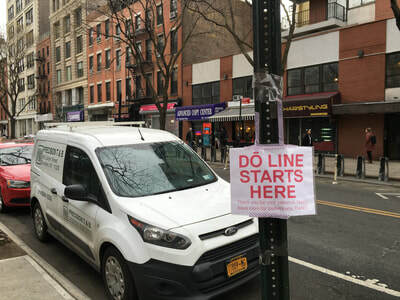 Dominique Ansel is the home of the famous cronut. 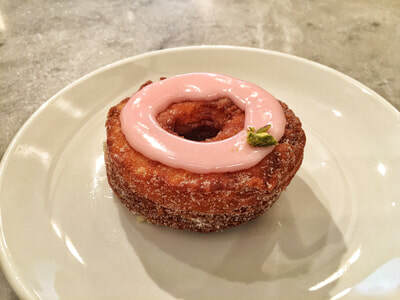 You might have had a cronut before, but it was probably a knockoff. This was the real thing. The home of the cronut where it was originally sold. That was not the only thing they sell there. They also have frozen s’mores and cookie shots. My Dad and I were so overwhelmed that we almost bought everything in the store. We came to our senses that we could not buy everything. 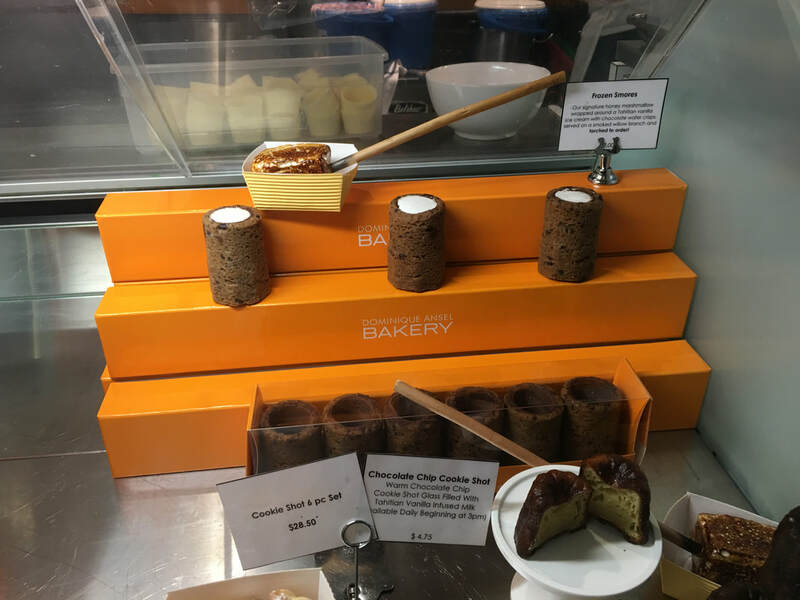 We paced ourselves and decided to buy a cronut, a frozen s'more, a DKA (which stands for “Dominique's Kouign Amann"), and madeleines. We ate the cronut, the frozen s’more, and one madeline there for breakfast. They have a monthly flavor for the cronut and the February flavor was lychee, rose, and pistachio. To be honest I thought I wasn't going to like it at first, but all the flavors went really well together. The outside was like a hard shell with a fluffy inside that had a mixed sweetness from the lychee and the rose. 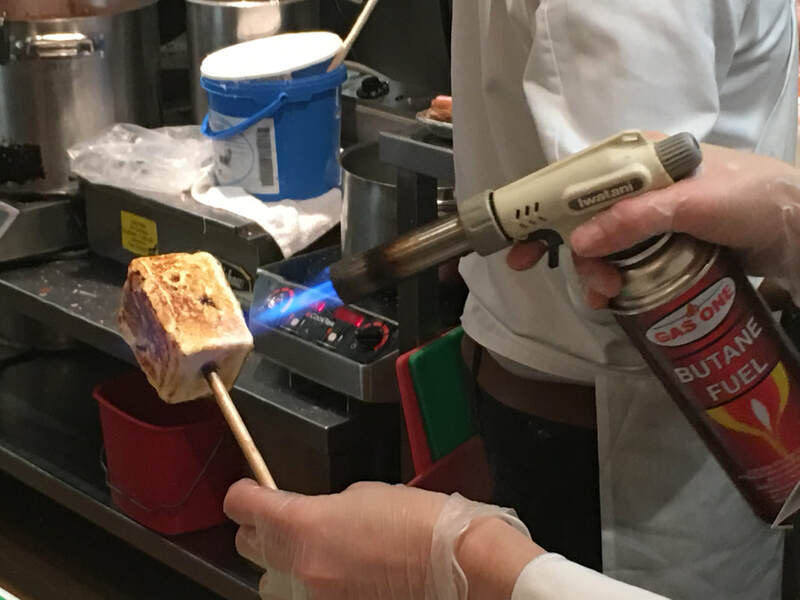 The frozen s’more was a marshmallow stuffed with ice cream and it was toasted on the outside. It tasted so good but it was super cold when you bit into it, but it paired well with a warm marshmallow. 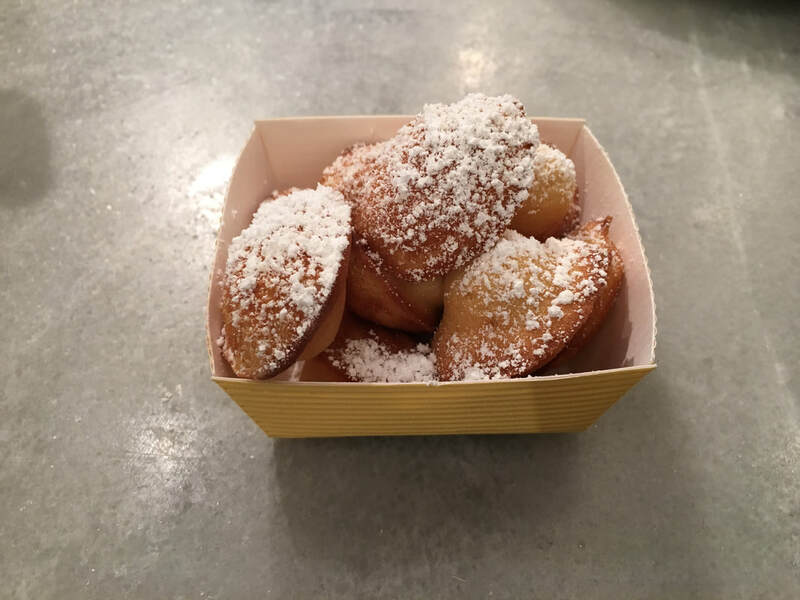 Even just one madeline was enough to get your taste buds dancing. When you ate them warm they taste so good. As I said, we each had one. They were moist and warm and you can taste the lemon zest which didn’t overpower the madeline but was just enough to it balance it with the fluffiness. I kept asking if I could have one more as we were walking to our different stops, but my dad kept reminding me that we had to save some for my Mom and my brother. At home, we tried the DKA. It was almost like biting into a pastry filled with creme brulee. The glazed outside was similar to the cronut, and the cream inside was heavenly. My mouth is watering as I even think about it. Our second stop was DŌ, where they sell raw cookie dough that is safe to eat so you won’t get sick from the raw eggs and the flour. They used this special flour without any of the bad chemicals and used these special eggs that were specially grown. The lines at this place were said to be sometimes up to four hours. Now, I know what you are thinking four hours just for cookie dough! You have already eaten raw cookie at some point in your life. 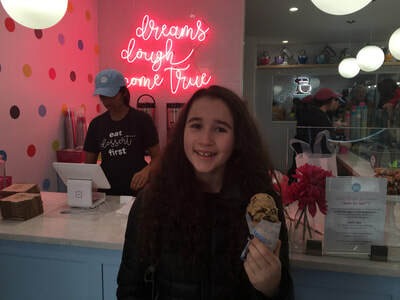 That is probably true, but they also have cool flavors like S'mores, Fluffernutter with marshmallow fluff, and Heavenly (with nutella, caramel, and chocolate). Now tell me you do not want to go DŌ even if you have had cookie dough! My dad and I got lucky and we were second on line and only had to wait an hour and a half. It seems long but it really wasn’t that bad. When it was time to go in, they gave the first 20 people tickets to go. My Dad and I of course already had a game plan of what flavors we were getting. 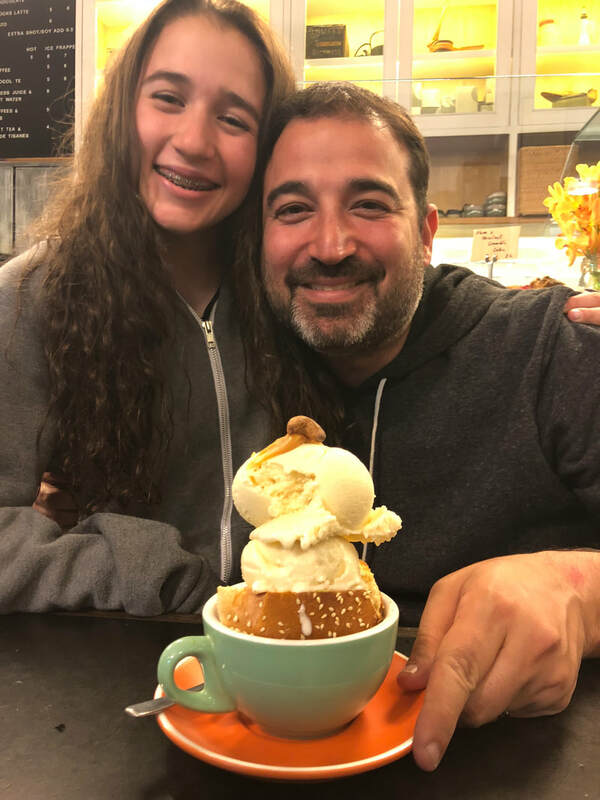 We got their signature chocolate chip to eat right away in a chocolate chip cone and then got chocolate chip, S’mores and Heavenly to go. 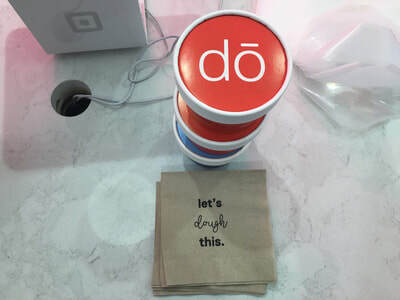 Since we were going to be walking around a lot, they gave us a freezer bag with the DŌ logo on it and two ice packs to keep them cold. We took the cookie dough in the cone to Washington Square Park and took cool pictures of it before we ate. It was so rich and creamy and it tasted better than any other cookie dough like Toll House or Pillsbury. My favorite flavor was the S’mores because it tasted like summer and sitting by the campfire. Basically, if you are on a food crawl or have nothing to do, go to DŌ and I guarantee you’ll love it. Next we had to go to ramen. 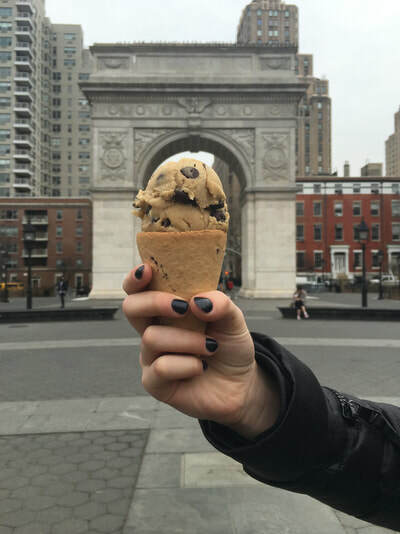 In the February weather, how could we resist? 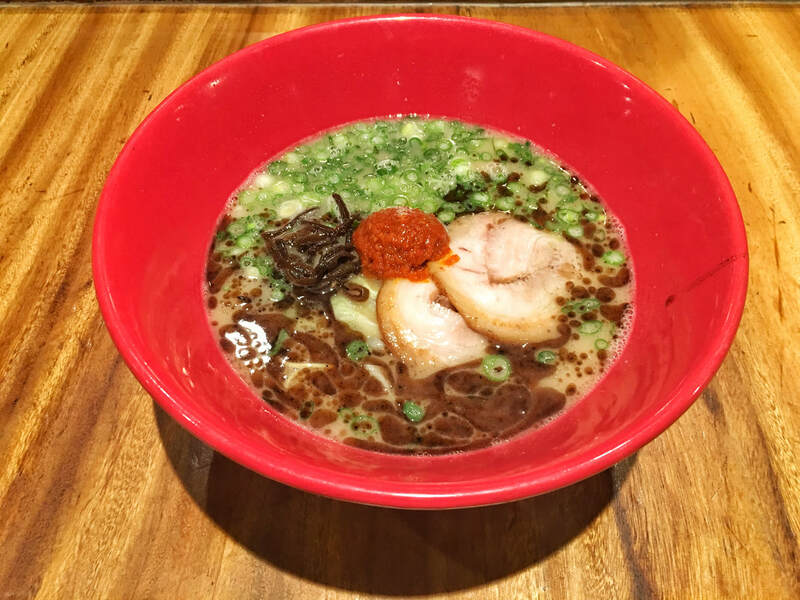 So, we went to one of my Dad’s favorite ramen spots in the city, Ippudo Ramen. We were the first ones in and my stomach was growling for real food, not just sugar. 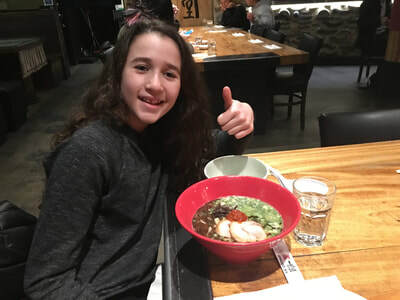 As soon as it opened we walked in and at Ippudo Ramen whenever someone walks into the back where the tables are, they shouted so that everyone knows that you are walking into the restaurant. It was very fun and creative. When we sat down it was kind of like looking at a forest. There was a huge tree in the middle of the restaurant. It was a cool design. We got the first bowl of ramen which we split obviously. But even that little bowl was enough for me to know it was the best ramen I had ever tasted so far. I know I always say that but I am not exaggerating. 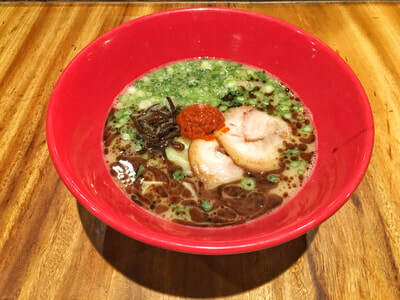 The description of the soup was: the original silky “Tonkotsu” (pork) soup noodles topped with Ippudo’s secret “Umami Dama” miso paste, pork chashu, cabbage, sesame kikurage mushrooms, scallions, and fragrant garlic oil. Now I am sure your mouth is watering. Usually I do not like tonkotsu broths, but this broth was different. It was silky and had a salty taste that balanced with everything in the bowl. The noodles tasted fresh and weren’t soggy at all, and the Umami Dama was super good even though I didn’t think it would be, but it was delicious and brought the soup together. Overall, it was the best ramen ever!!! The next place we went to was a little bit far, but totally worth the walk. It was Sugar Fish, a really popular sushi restaurant. It had a pretty decent line, but we were in the first wave of people and we got the second to last table. We were doing really well on timing everything out. On the menu, yes they do have regular sushi rolls that you can get, but why do that at this amazing restaurant? Why not let them pick for you? So, we did. We picked the “Trust me” menu. I got the smallest size and my Dad got the medium size. 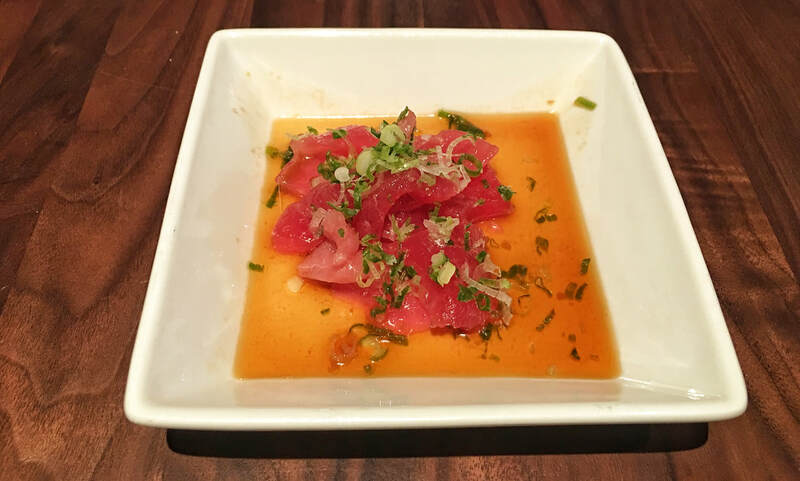 At Sugar Fish they have a rule that they will not give you any extra soy sauce, wasabi, or rice. They did this because it was the traditional Japanese way of eating sushi. On the menu they also have other rules that they follow at Sugar Fish. 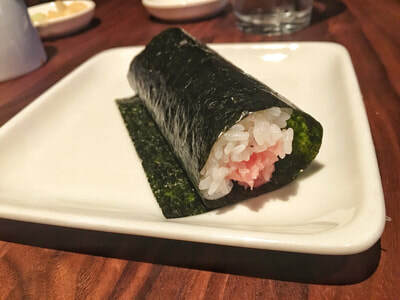 For example, they want you to eat any hand rolls immediately, and also dishes that have sauce on them already should not be dipped in any other sauce. 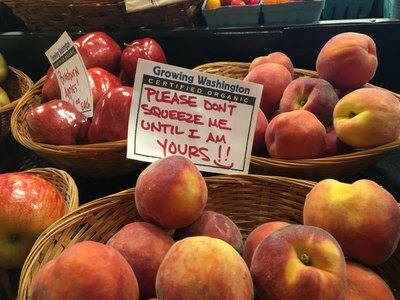 I have to admit I was a little nervous at first because although they show you what you are going to get, I wasn’t really familiar with what I was about to eat. We started out with edamame, but our first fish dish was tuna sashimi. Now, I have to say I do not like soy sauce it is way too salty for me. That day though I had an exception, because the sauce was so good. It was salty, but also a little sweet and it went really well with the tuna. The only complaint was that it was really little and I wanted more of it on the plate. The next dish was a sushi dish it consisted of; Albacore Sushi (1-pc), Salmon Sushi (1-pc), and Yellowtail Sushi (1-pc). The sushi had a sauce on it that was sweet and it really complimented the flavor of the fish and the soft hot rice. When you dipped the sushi in the soy sauce all the flavors blended making it so much better, especially since it wasn’t a ton of soy sauce and you can actually taste the dish. The last dish for me (my dad had one more dish) was I had a toro hand roll. When it came I was so excited to eat the roll it looked delicious and I was starving. The crispy seaweed went really well with the soft warm rice and the cold crisp fish. I really wish they had sent out two. It just felt like a perfect combination especially to end the amazing meal. I suggest if you do go there to just put a little faith in them and get whatever size Trust Me suites your hunger. Then we just went around shopping at a few places. We went to Beecher's Handmade Cheese. It has the “World’s Best Mac & Cheese” that is the brand name but it actually is the best. There cheese is amazing and I especially like the Flagship. 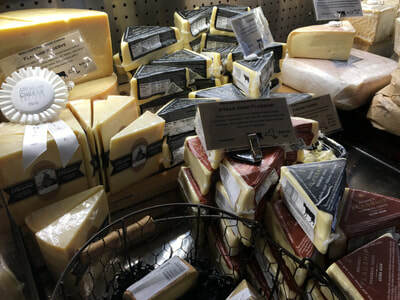 We got to sample them so we eventually got my favorite Flagship cheese to bring home. After we went to Beecher's, we went to Eataly, but stopped to take pictures of the Flatiron building. It is a building that has an illusion of being flat. Inside there are all types of stores, but it is the outside that people really enjoy. Then we were off again to Eataly. 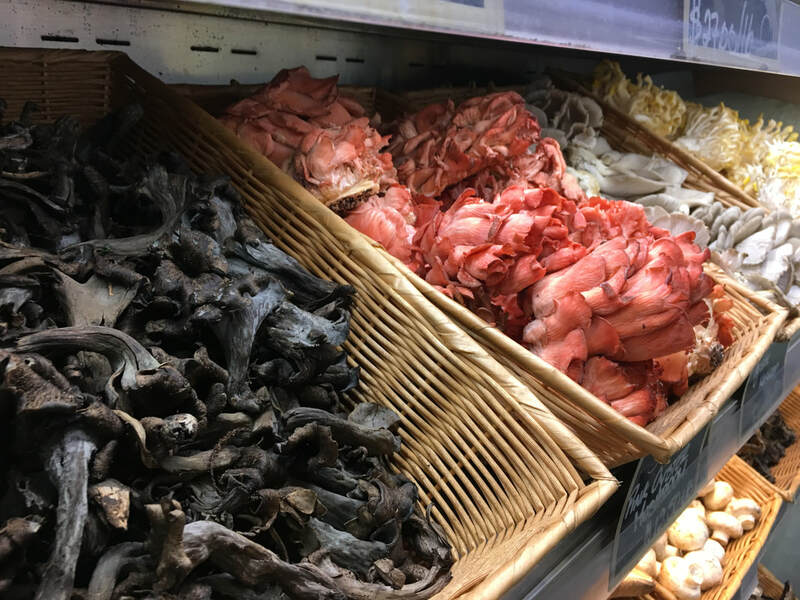 The reason why I love Eataly is because it reminds me of an outdoor market, all crowded with different parts of the building selling different things. One thing it is famous for is a whole entire wall with Nutella jars on it. We walked through the markets and looked at all of the different vegetables in the market. 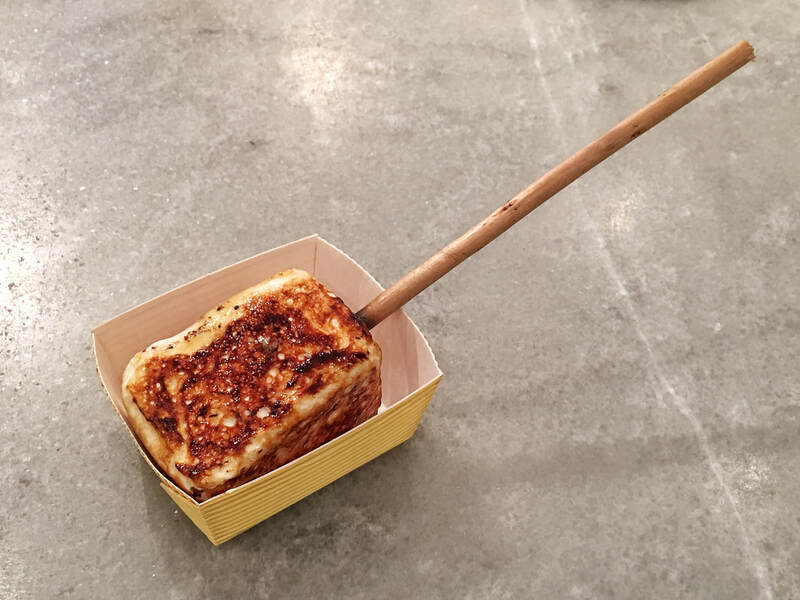 We also got to taste a cheese that no one can touch because the cheese sweats. Now, I know that sounds gross, but we tasted the cheese and it was really good. We asked the man who handled the cheeses why it did that. He said that the cheese’s moisture builds up and turns into sweat. It was really cool to just go there and walk around, not just to try the food. 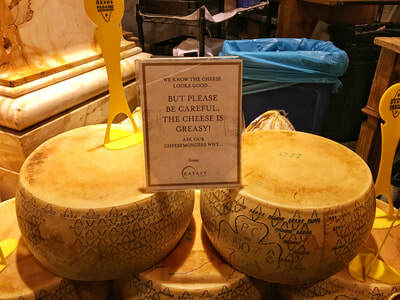 I really love Eataly and hope I can go the next time we decide to go into the city. 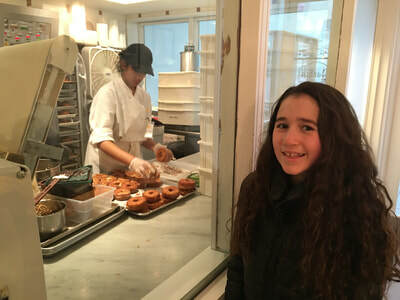 The last place we hit up before going home was Doughnut Plant. They have very creative flavors of donuts that are super delicious. This was my first time though, but my Dad had gone before. 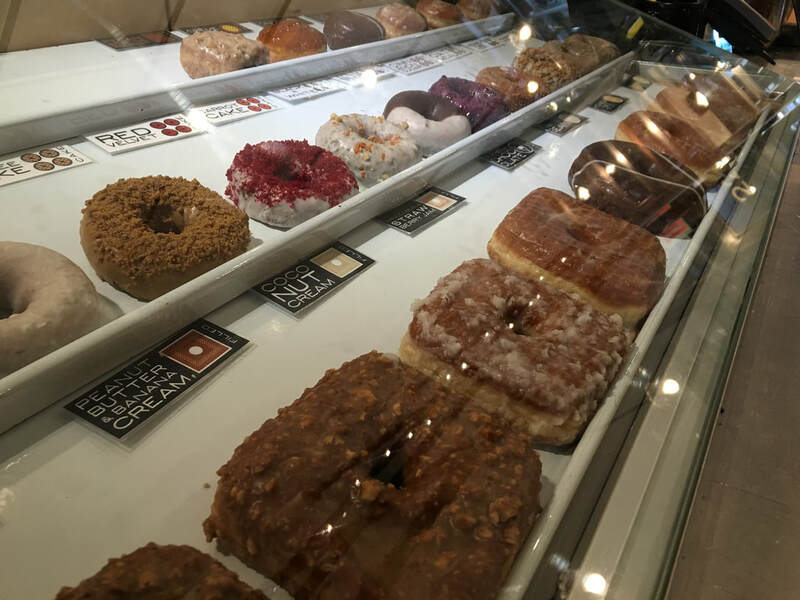 There are so many names for donut shops that are so similar that sometimes I mix up their names, like Doughnut Plant and Donut Project. We walked into our last stop exhausted from our long day to the smell of delicious donuts. It was a little place that was perfect for our last stop. On the wall there were donut pillows that were awesome. We decided to order a creme brûlée donut, a carrot cake donut, and a tres leches donut. We took them home and didn't have any there. The creme brûlée donut had a nice creamy filling and tasted exactly like creme brûlée. The carrot cake was my favorite. It was a moist cake with an amazing cream cheese frosting. Cream cheese frosting is my favorite frosting, so obviously I took a liking to it. The last donut was a tres leches donut. It is a donut that has three milks; whole milk, condensed milk, and evaporated milk. It was a very moist cake and I thought it wouldn't be that good, but it was amazing. I would definitely go back if I was in that part of the city again. Overall, I had an awesome time in the city and cannot wait for the next food crawl! I don’t know about you guys but I can literally not stop singing Hamilton songs. They are too good! It is so hard to get tickets to it because they are really expensive and they sell out really easily. Lucky for me though, my dad got tickets to see it last year for this January! In the 1920s, people went to Broadway shows and then after they got out they would go to Sardi’s, a restaurant near Times Square. It was a tradition, and now everyone says that every New Yorker should go there before or after a Broadway show at some point. So, that is just what we did. We went to Sardi's for dinner before Hamilton. When we got there, on the walls were pictures of famous people who have been there. 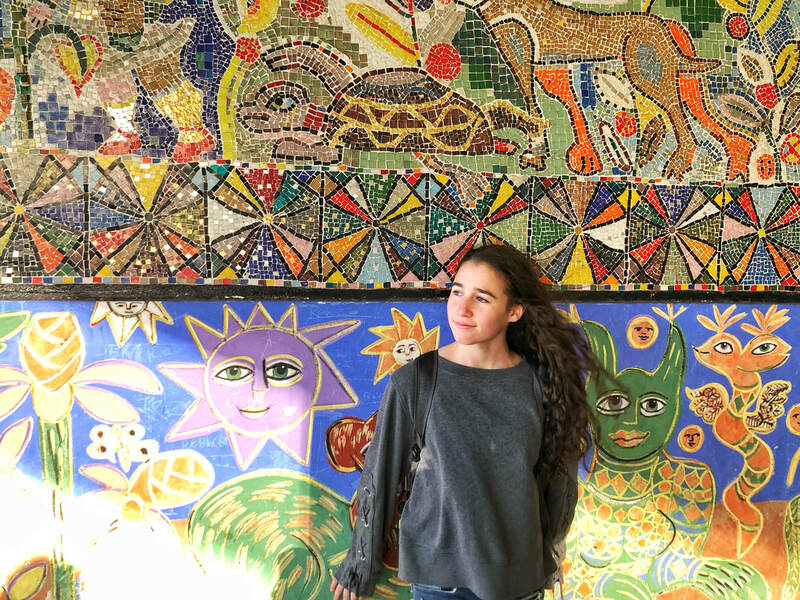 Actors, actresses, and politicians were all up on the wall. The best one in my opinion was Lin Manuel Miranda in the front of the restaurant. For those of you who do not know who Lin Manuel Miranda is, he created Hamilton and played him. Besides the picture it looked like the restaurant was right out of the twenties which I loved. I just got a burger which was good, but it was a burger. I think the thing that was really special was just to be there and sit where hundreds of stars have been. Hamilton was amazing. It was everything you would imagine and more. It was funny, sad, and happy all at the same time. Also it teaches you about the history of our founding fathers. Now, go online and buy Hamilton tickets, and if you get them stop by Sardi’s for a quick bite before the show.